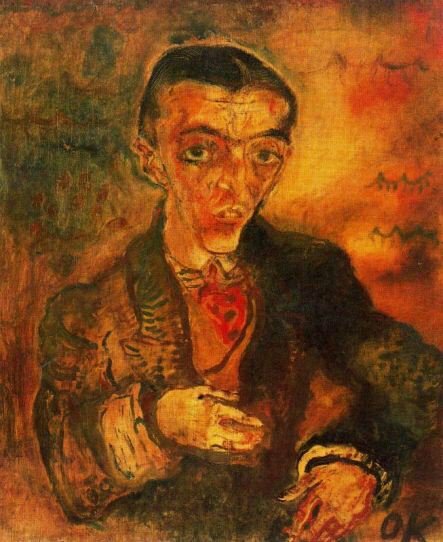 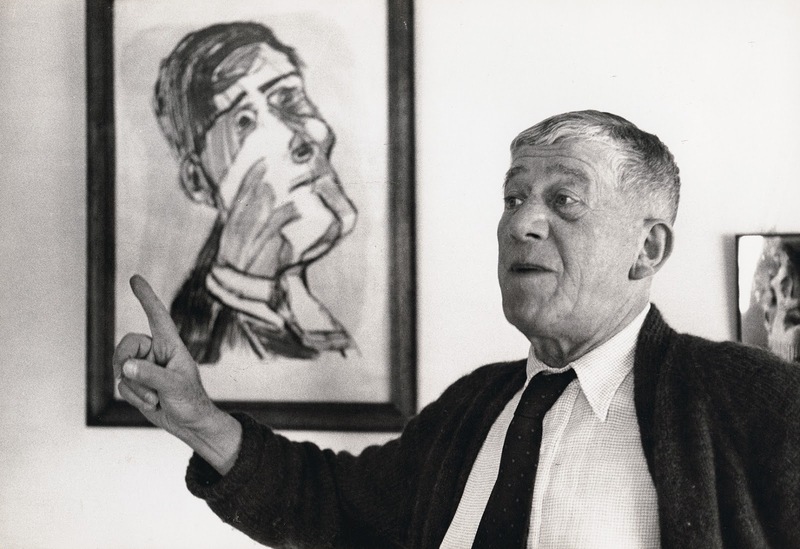 Oskar Kokoschka, (born March 1, 1886, Pöchlarn, Austria-died February 22, 1980, Villeneuve, Switzerland), Austrian painter and writer who was one of the leading exponents of Expressionism. 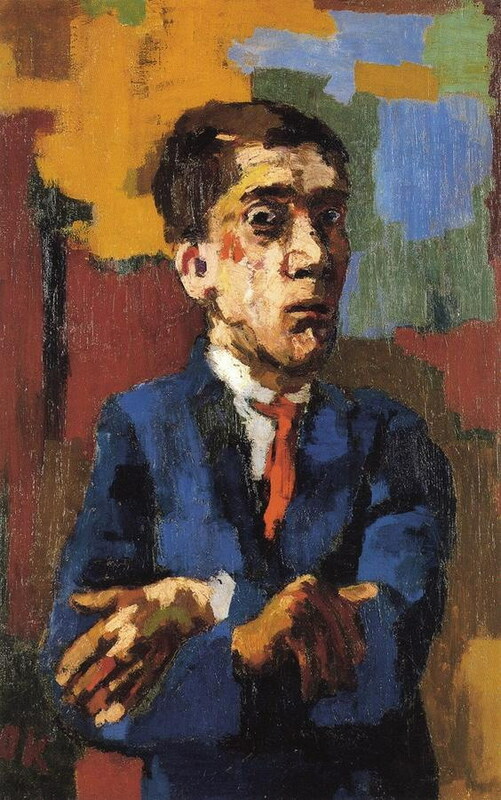 In his early portraits, gesture intensifies the psychological penetration of character; especially powerful among his later works are allegories of the artist’s emphatic humanism. 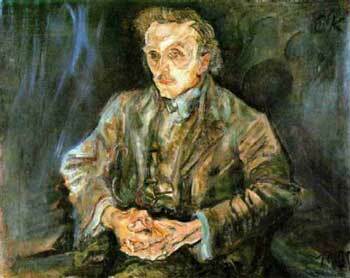 His dramas, poems, and prose are significant for their psychological insight and stylistic daring. 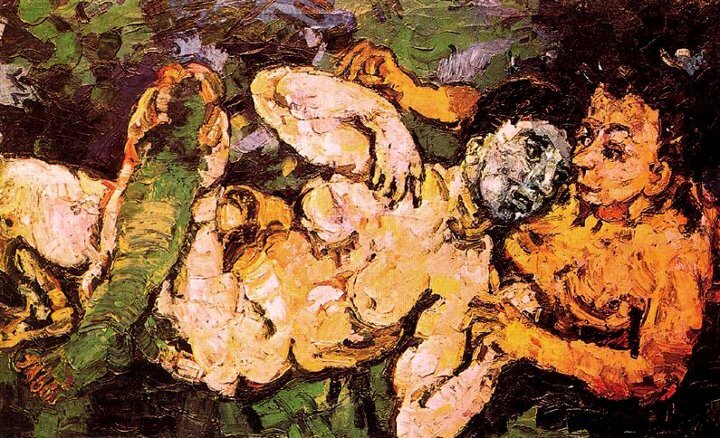 Early life and worksWhen Kokoschka was three years old, his father went bankrupt in a financial crash. 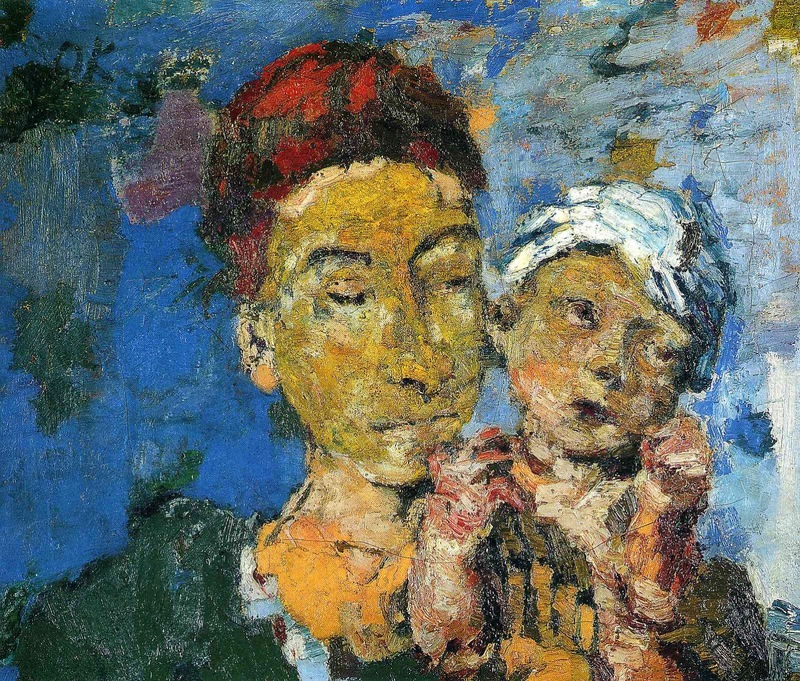 The family was forced to move to Vienna, where his father worked as a traveling salesman and his mother cared for the children on limited means. 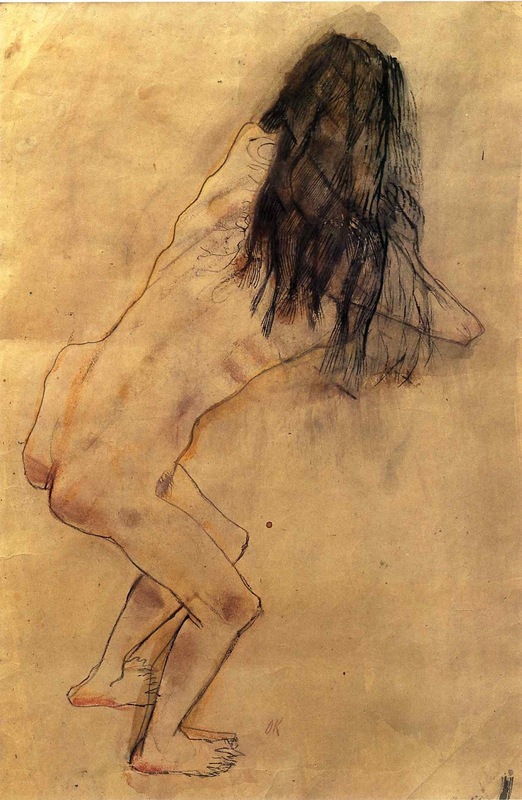 Tragedy entered the artist’s life early, when his eldest brother died in 1891. 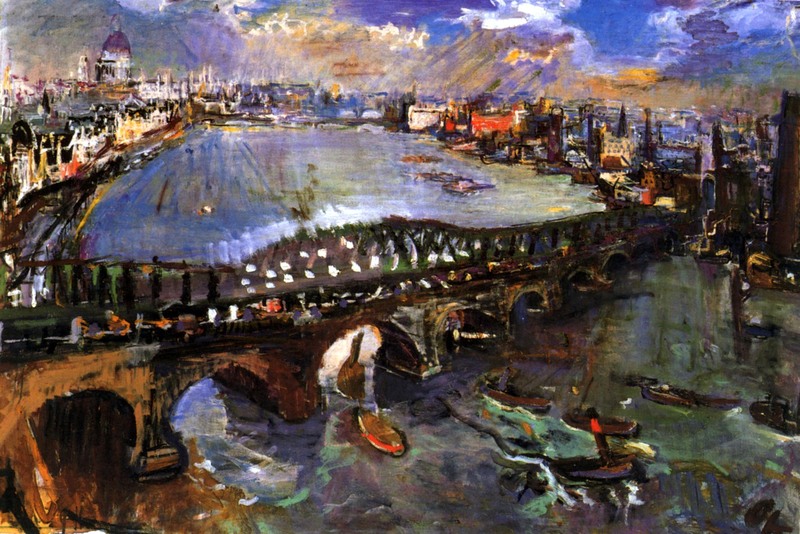 Kokoschka attended elementary and high school in Vienna and received his first artistic impressions from the stained-glass windows and Baroque frescoes of the Church of the Piarist Order, where he sang in the choir. 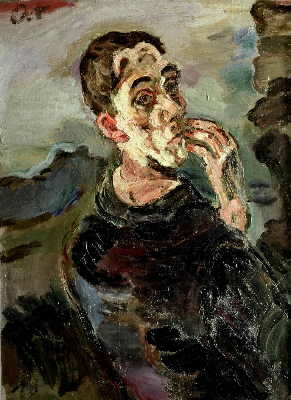 At age 18 Kokoschka won a scholarship to the School of Arts and Crafts in Vienna. 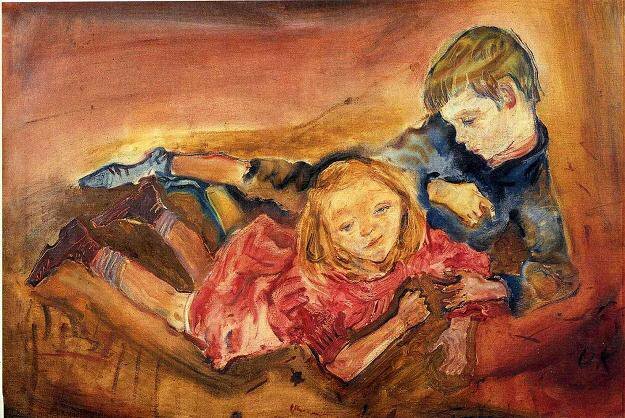 Soon he became an assistant teacher there, giving lessons at night and studying during the day. 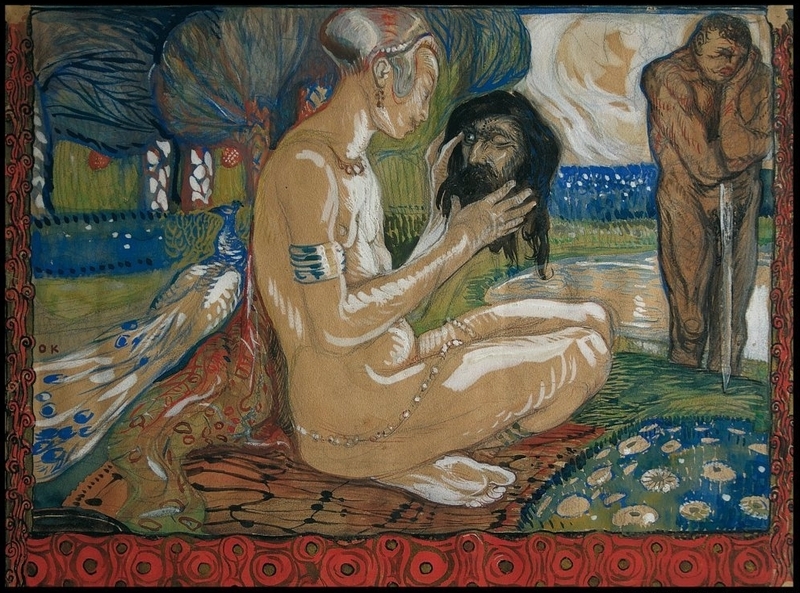 By 1907 he had also become a member of the Vienna Crafts Studio, which supplied him with commissions until 1909. 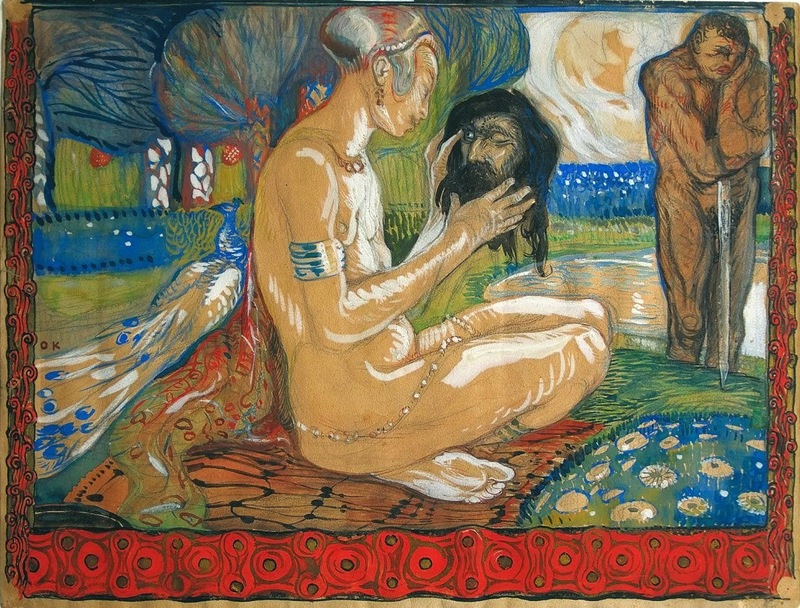 At the School of Arts and Crafts he learned drawing, lithography, bookbinding, and other crafts. 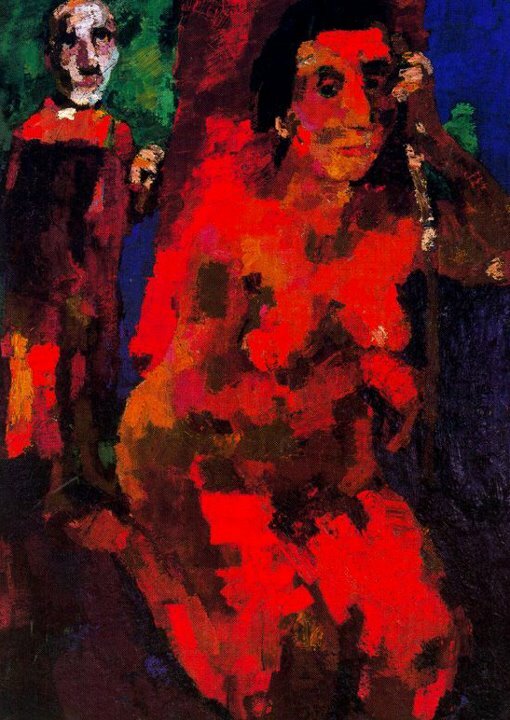 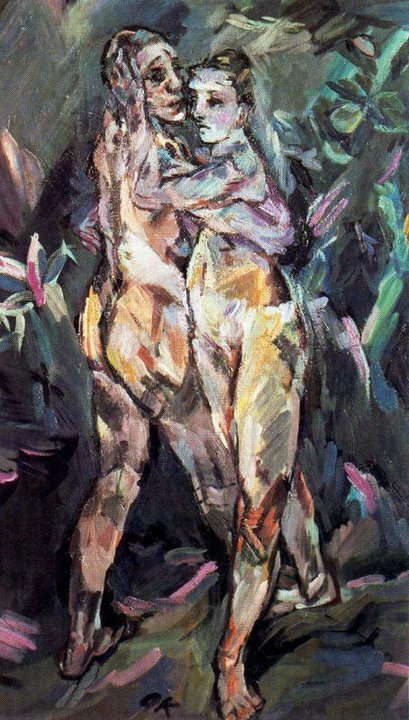 Kokoschka was profoundly dissatisfied with the school, however, because it was devoted entirely to the decorative arts and completely omitted from its curriculum the study of the human figure. 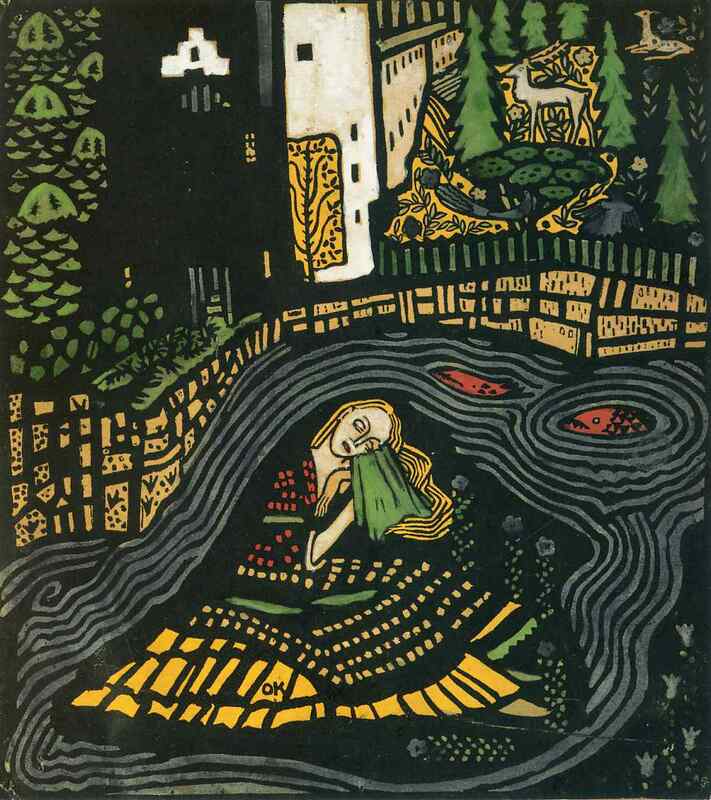 The Vienna Crafts Studio, too, supported work only in the field of the decorative arts. 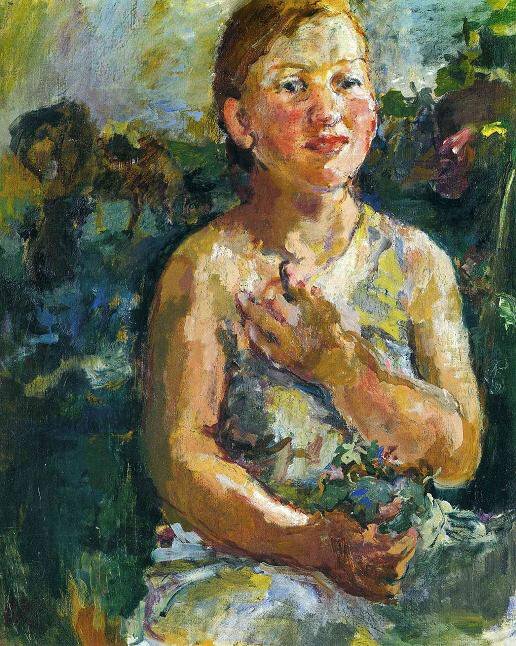 From the beginning Kokoschka’s primary artistic interest was the human figure; this interest was perhaps rooted in his deep concern for humanity, which transcended even his concern for art. 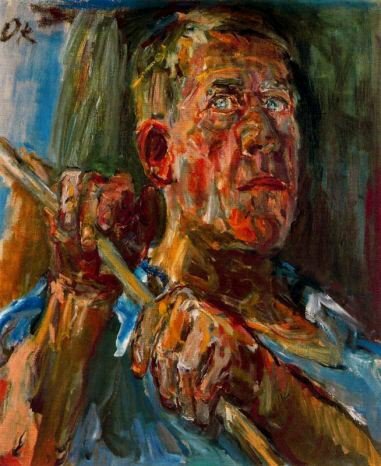 He tried to find practical means to pursue this interest. 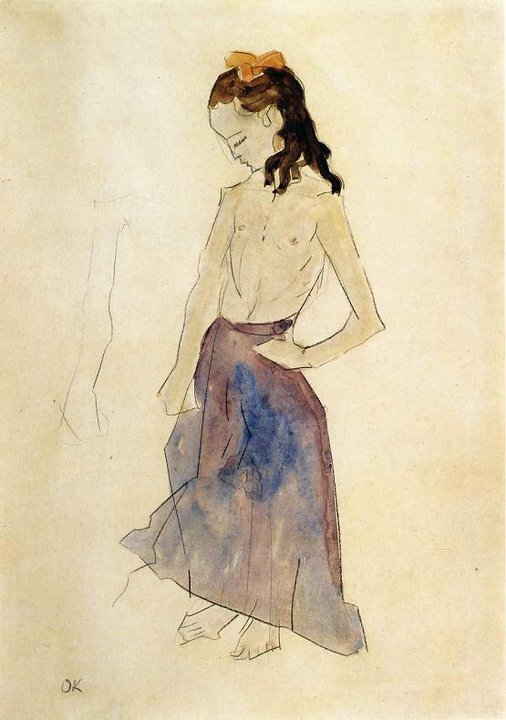 In his night classes he hired the thin, muscular children of acrobats as models, teaching his pupils to make quick sketches. 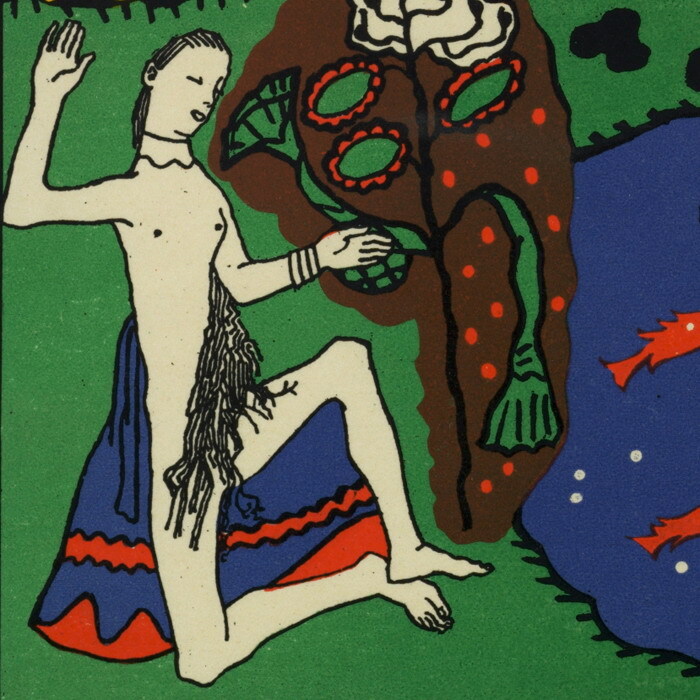 He used the human figure as a decorative motif in the postcards, bookbindings, and bookplates he designed for Vienna Crafts Studio commissions. Still, his real desire was to create monumental paintings. 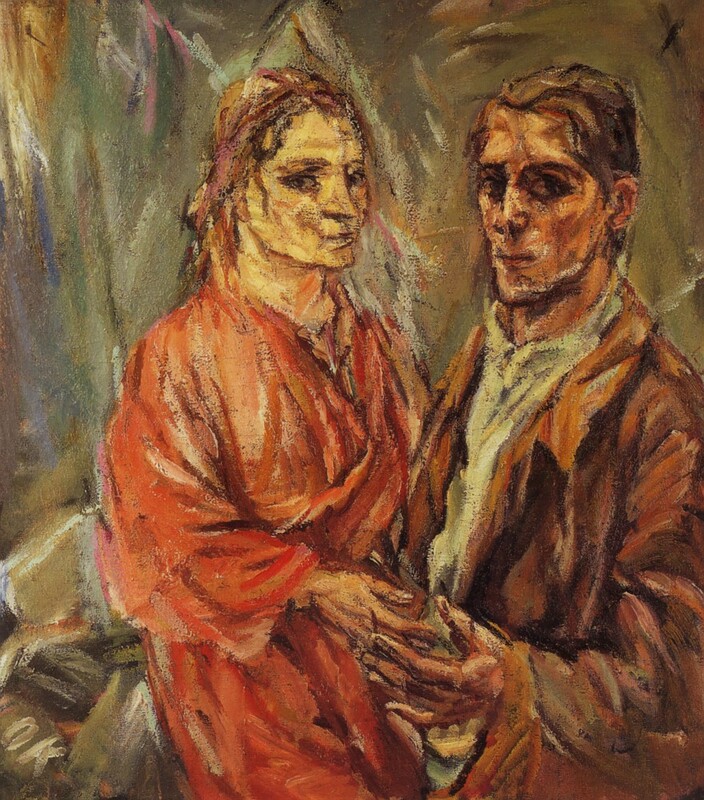 Kokoschka taught himself to paint in oils and executed some canvases, but economic necessity forced him to spend most of his time on decorative work, and the general artistic milieu around him continued to be unsupportive of his creative aspirations. 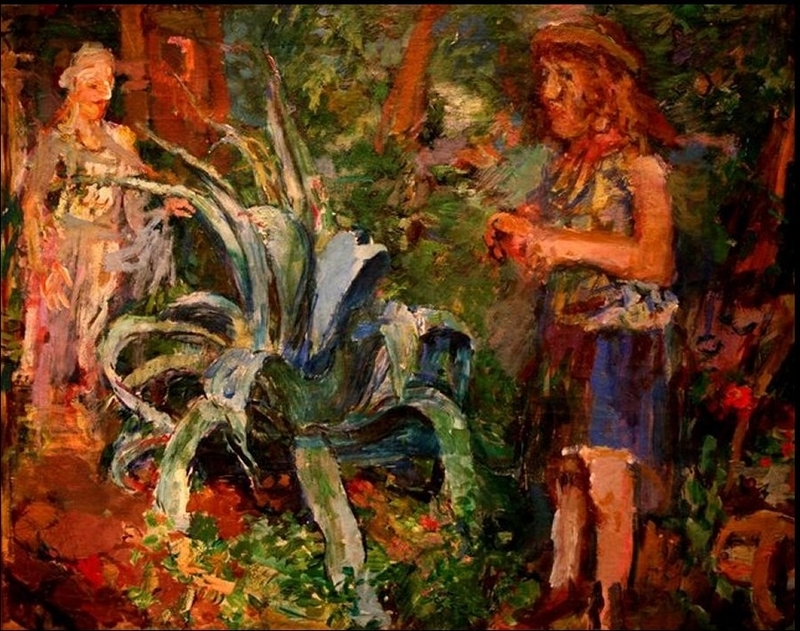 In 1908 he met the prominent Viennese architect Adolf Loos, who, having been impressed by one of Kokoschka’s early paintings, took an active interest in the young artist. 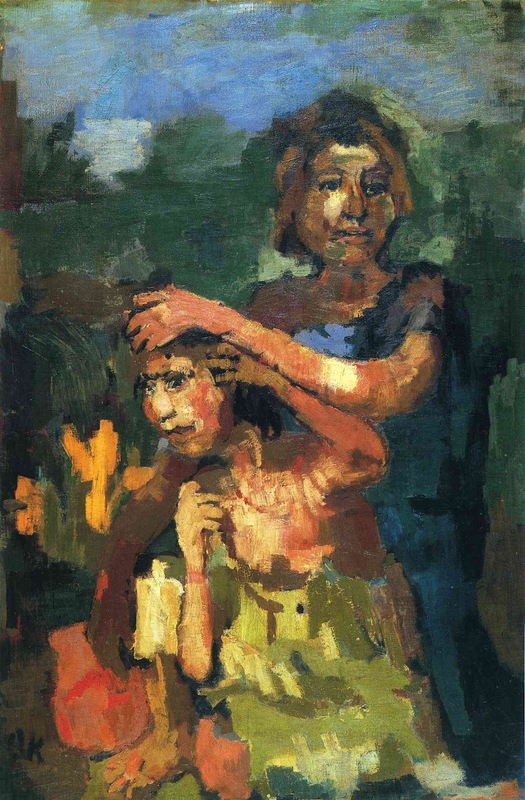 Like Kokoschka, Loos rejected the prevailing decorative ideal, and he enthusiastically launched Kokoschka’s artistic career by introducing him to sympathetic artists, securing him commissions for paintings, and providing him with much-needed spiritual inspiration and support. 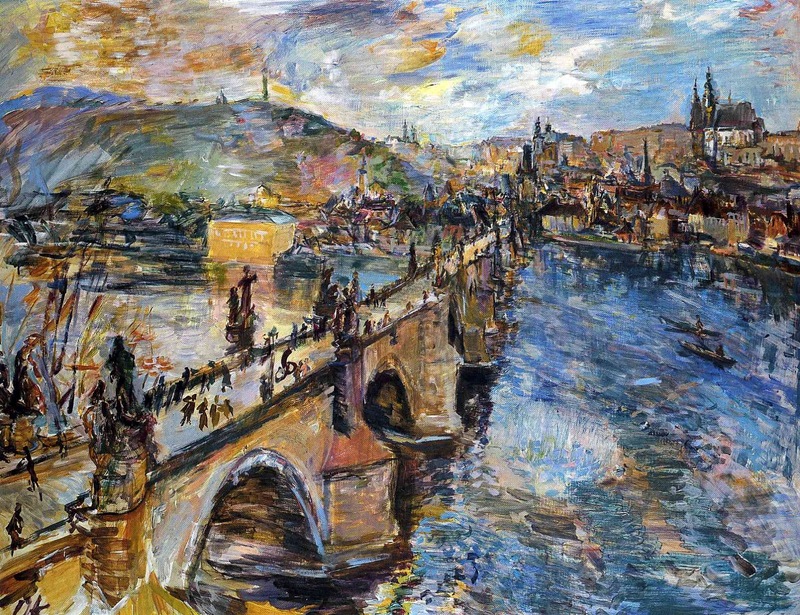 During this early period Kokoschka painted mostly landscapes, developing a technique of vibrant, fluid lines and expressive colours. 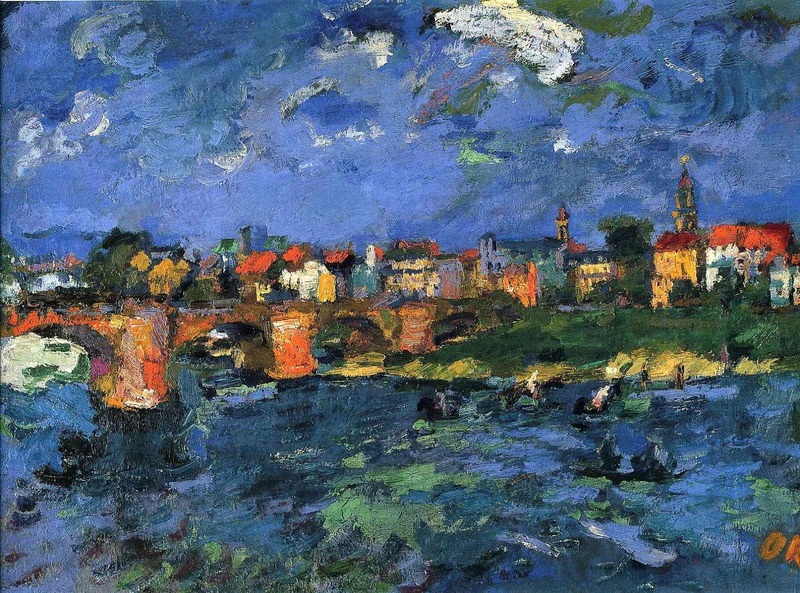 At first glance, Kokoschka’s landscapes seem to follow the principles of the Impressionist school because of their bright colours, ephemeral delineation of shapes, and preoccupation with light. 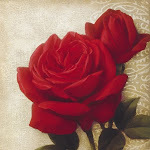 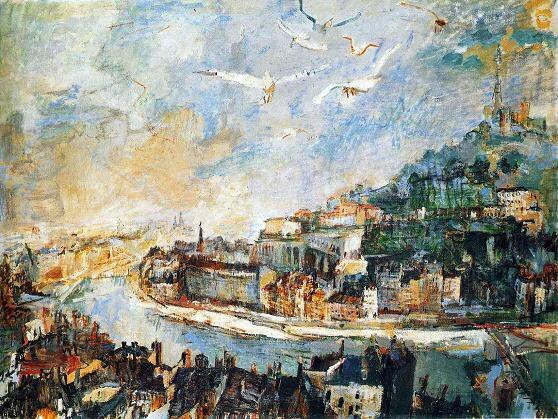 His vision, however, was different from that of the Impressionists, who sought to represent only what strikes the eye. 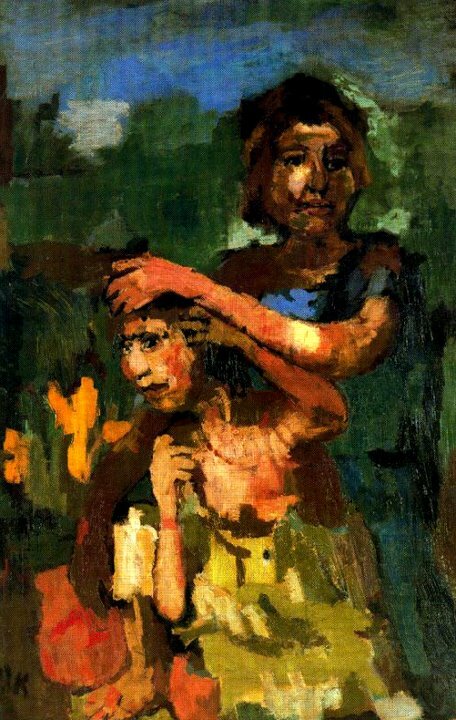 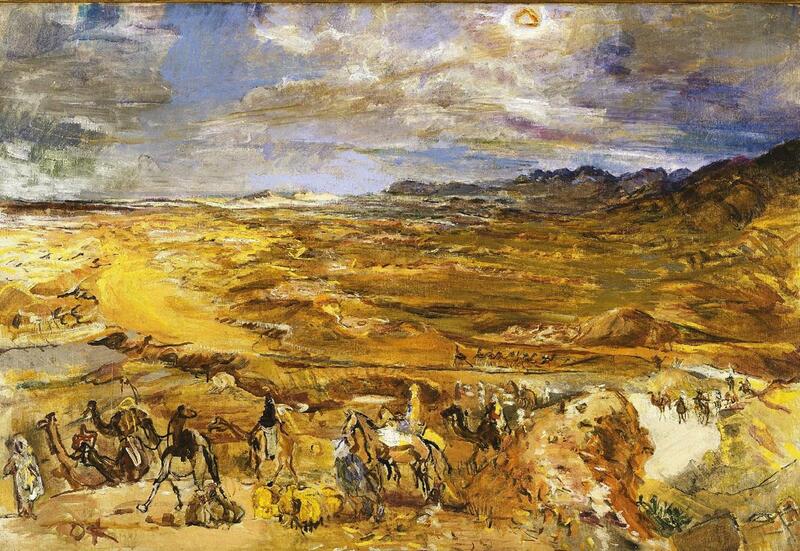 Kokoschka sought to express through his colours the emotional aspects of a scene. 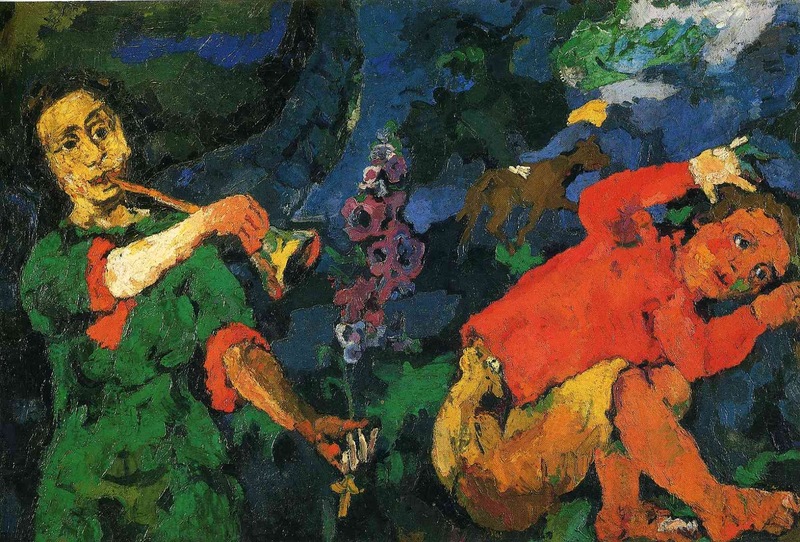 This aim is exemplified in one of his earliest paintings, Dents du Midi (1909), a snowscape rendered in warm colours; an Impressionist might have used cool colours to evoke the actual light emanating from the snow. 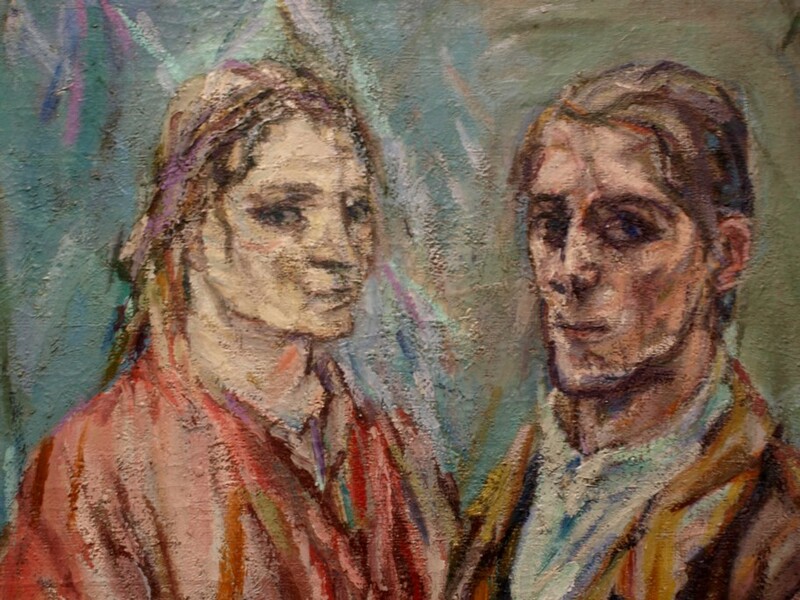 At about this time Kokoschka began his career as a writer, composing several plays that heralded the new Expressionist theatre and expressed his compassionately humanist philosophy. 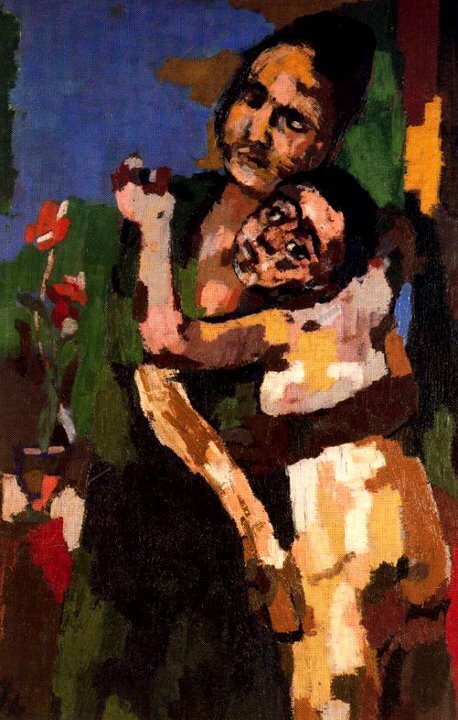 The most important of them was Mörder, Hoffnung der Frauen (1907; “Murderer, Hope of Women”), a play that expressed Kokoschka’s sensitivity to the moral crises of modern life and that condemned the political injustices of contemporary European society. 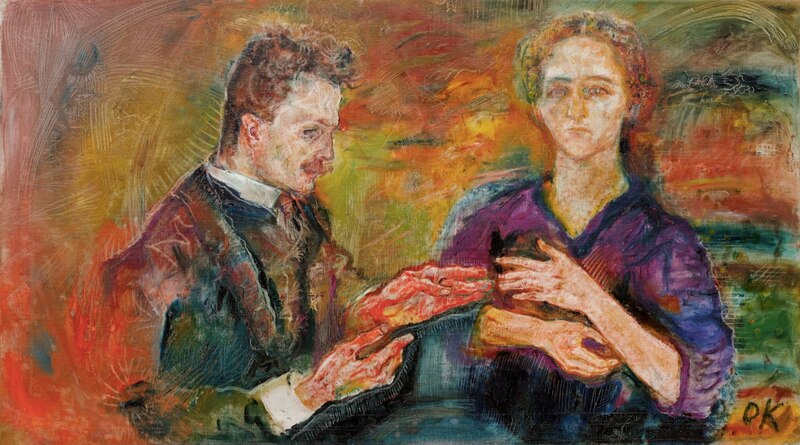 He said in 1933 that in this play he contrasted the callousness of our male society with my basic conception of man as mortal and woman as immortal; in the modern world it is only the murderer who wishes to reverse this state of affairs. 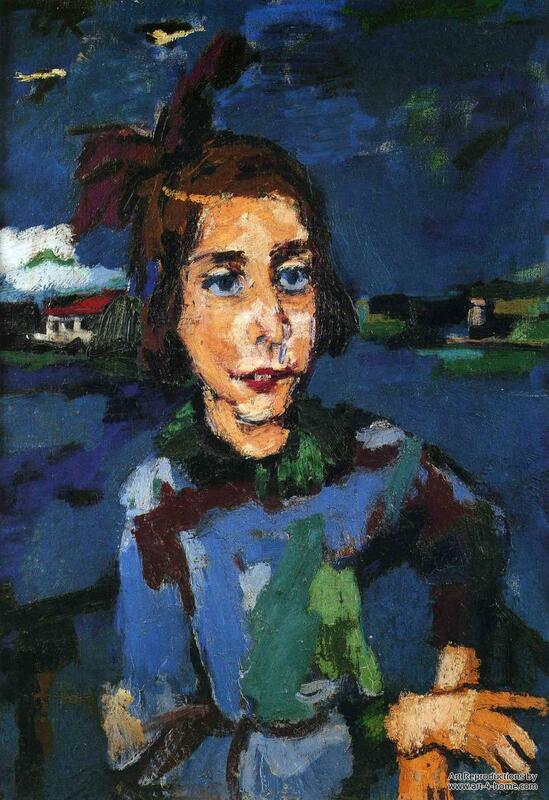 About 1908, shortly before his return to Vienna, Kokoschka began to paint portraits that show an extremely sensitive preoccupation with the character of the subjects, as well as an increasing concern with expressing this character through colour. 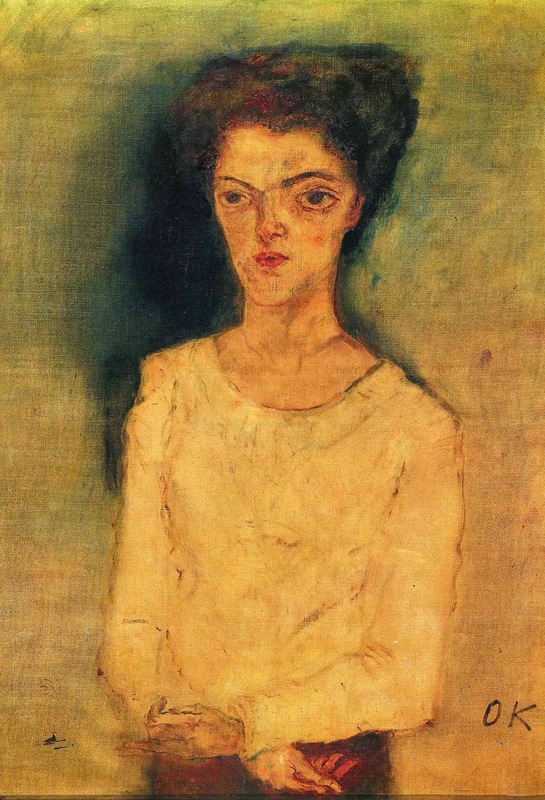 In early examples of these portraits, he made use of delicate, agitated lines to describe figures, which he painted in relatively naturalistic colours. 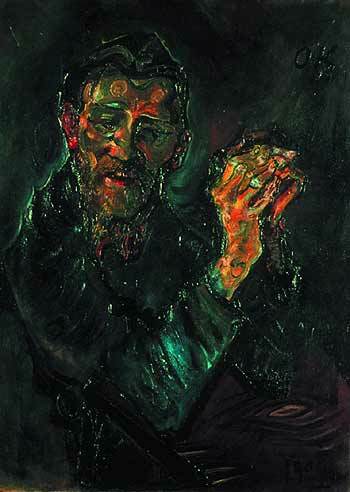 Kokoschka exaggerated certain features and gestures of the sitters to express their psychological states. 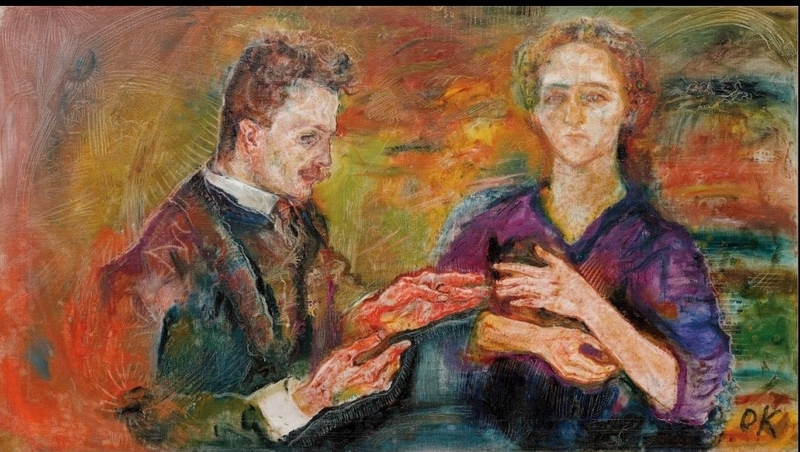 Among these portraits, which secured Kokoschka’s early reputation, are those of Hans Tietze and Erica Tietze-Conrat (1909), Peter Altenberg (1909), and Auguste Forel (1910). 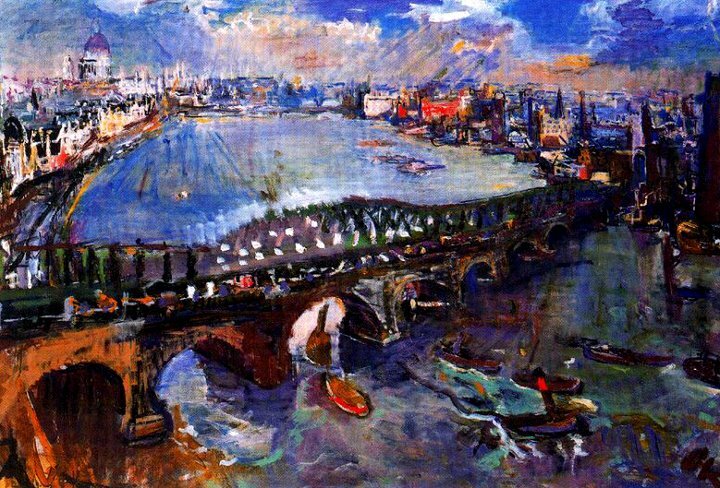 After a year in Berlin, where his first solo show was held, Kokoschka returned to Vienna in 1911 and resumed his teaching post at the School of Arts and Crafts. 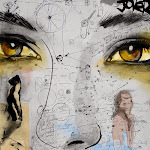 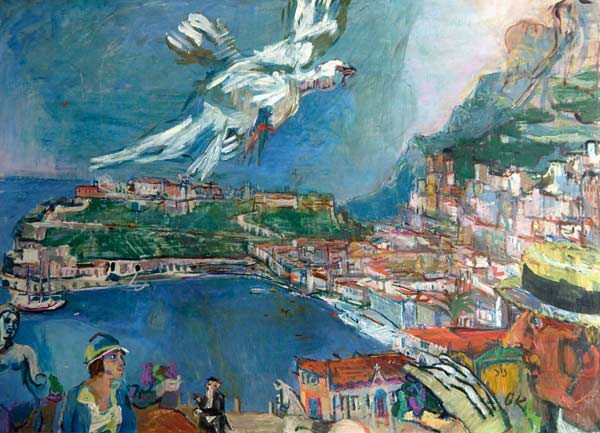 He exhibited paintings and drawings at Der Sturm gallery, where they hung alongside works of the Russian artist Wassily Kandinsky, the Swiss artist Paul Klee, and the German artist Franz Marc. 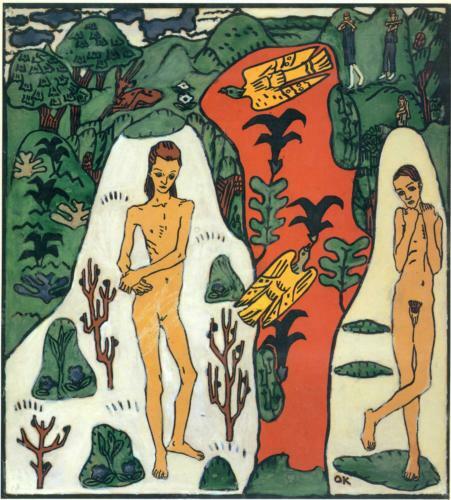 Soon public reaction to Kokoschka’s plays caused such a scandal that he was dismissed from his teaching position. 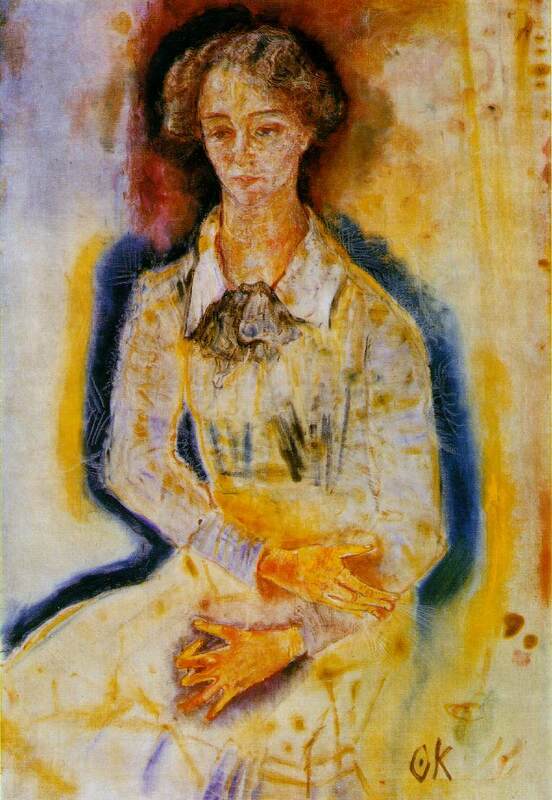 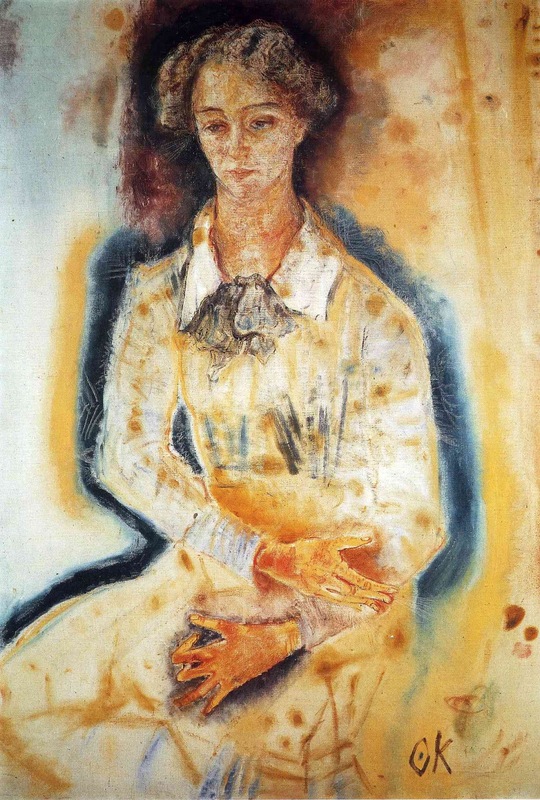 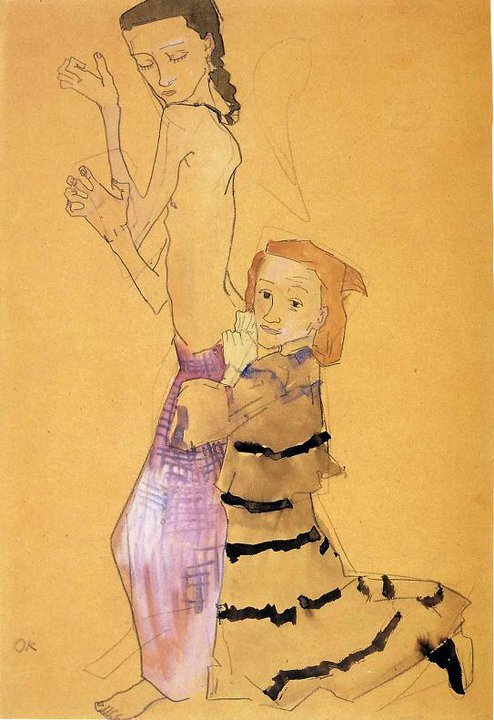 In 1911 Kokoschka met Alma Mahler, seven years his senior and the widow of the Austrian composer Gustav Mahler. 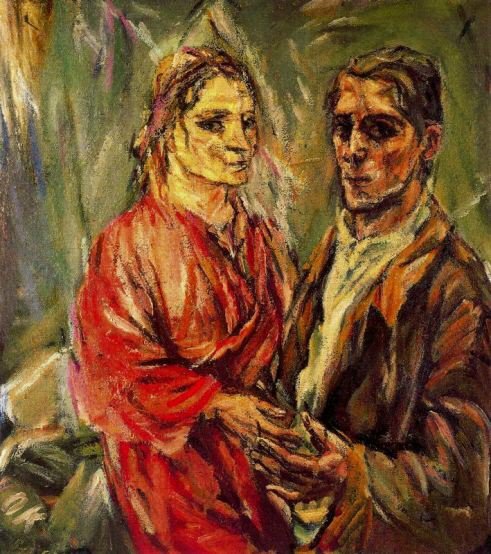 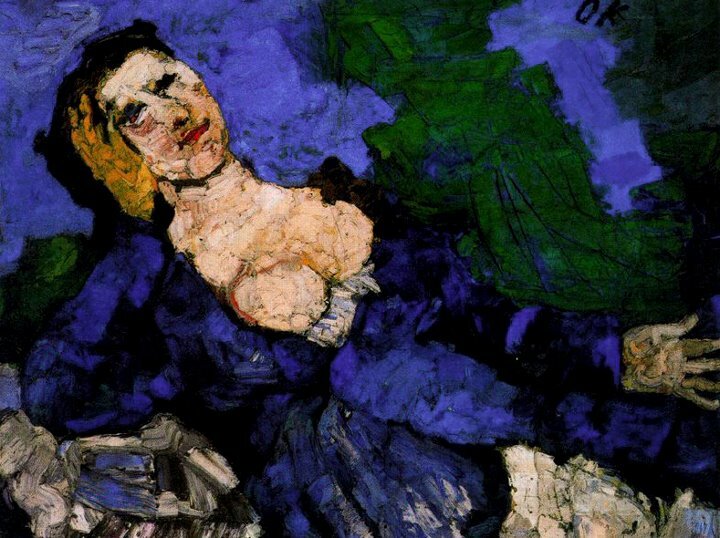 He fell in love with her, and for three years they pursued a tempestuous affair that Kokoschka much later described as “the most unquiet time of my life”, Their relationship ended with the outbreak of World War I and his enlistment in the Austrian army. 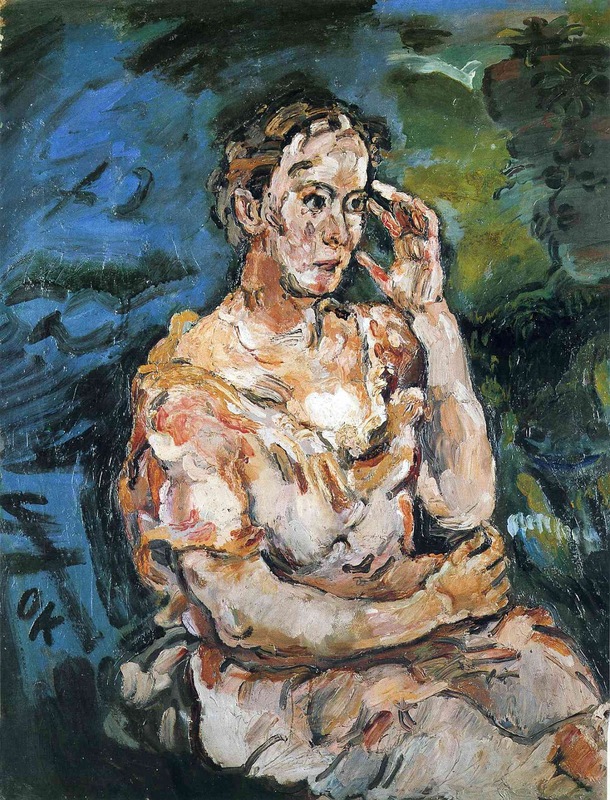 Starting about 1912, Kokoschka painted portraits with brushstrokes that were increasingly broad and colourful, and he used heavier outlines that were broken and that no longer solidly enclosed forms. 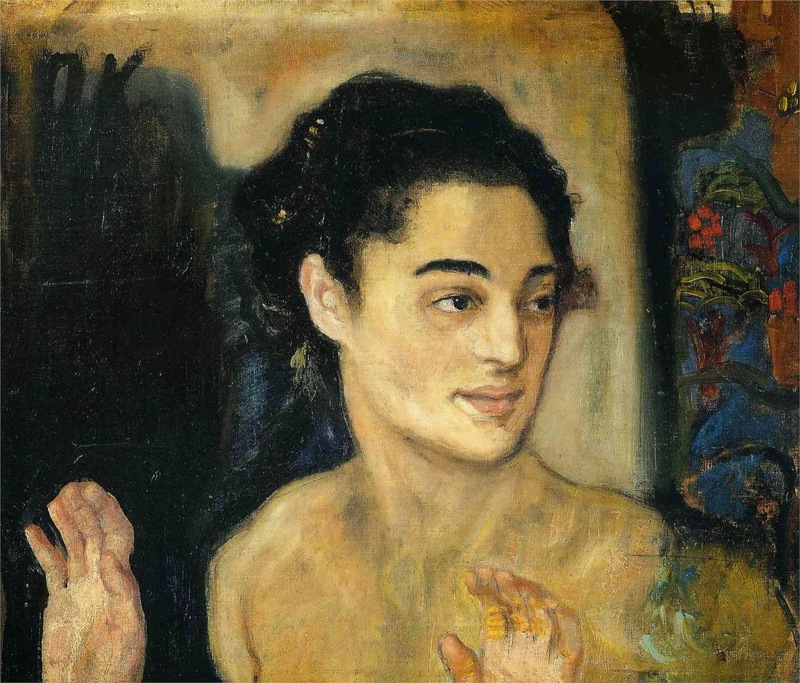 Among the works painted in this manner are Double Portrait (Oskar Kokoschka and Alma Mahler) (1912) and Self-Portrait, Pointing to the Breast (1913). 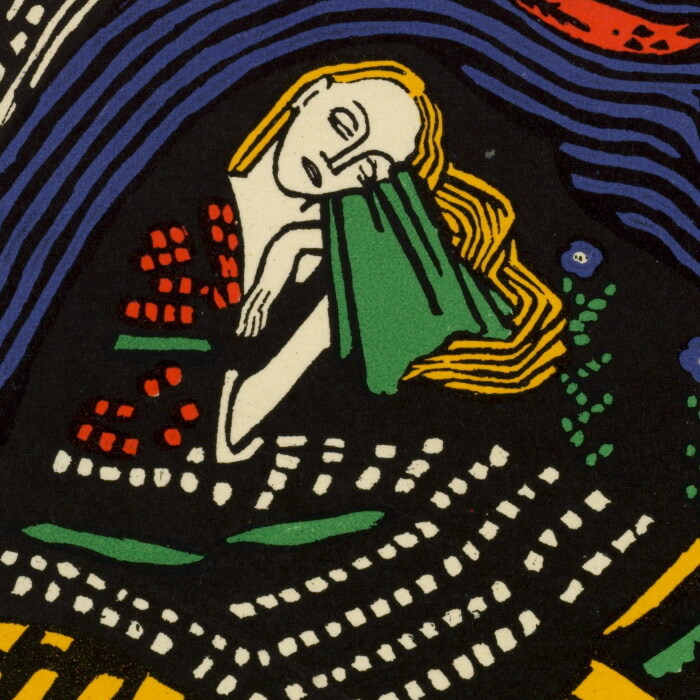 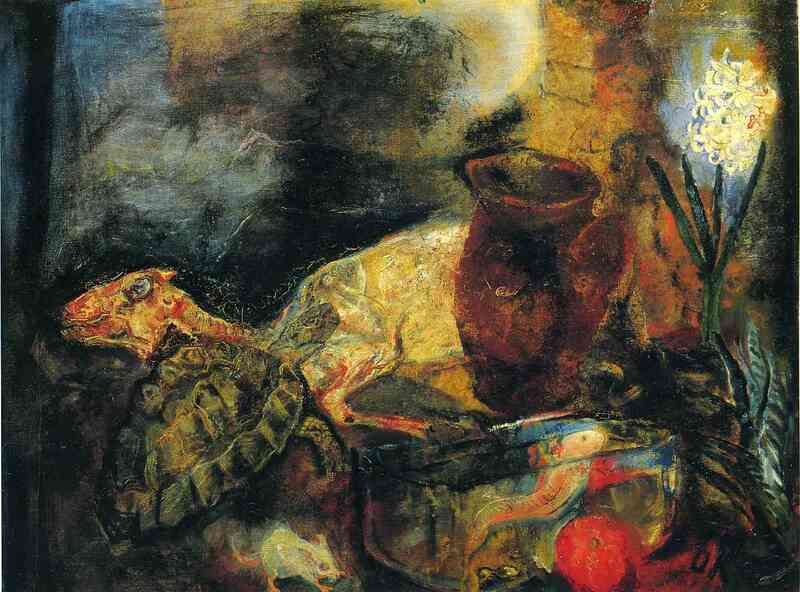 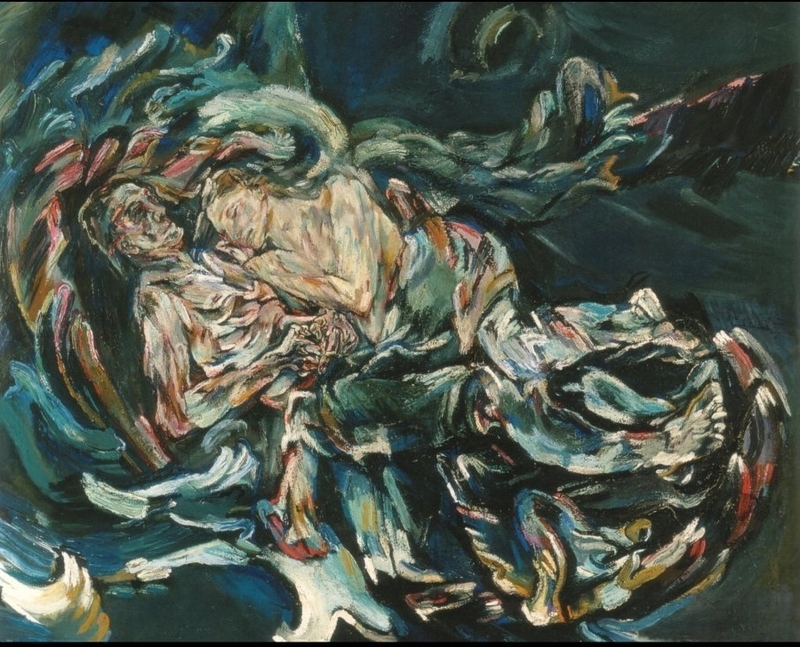 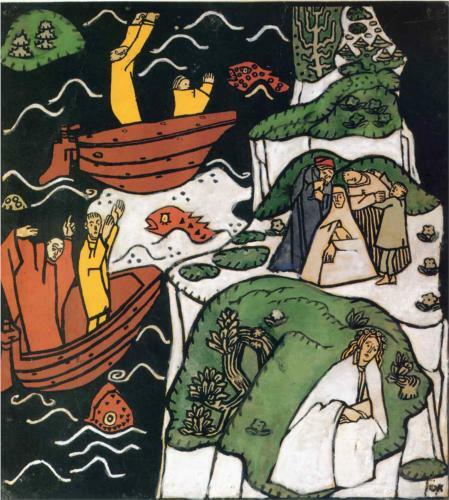 Kokoschka’s most important painting of this period, The Tempest (1914), shows the artist and Alma Mahler resting together in a huge cockleshell in the midst of a raging sea. 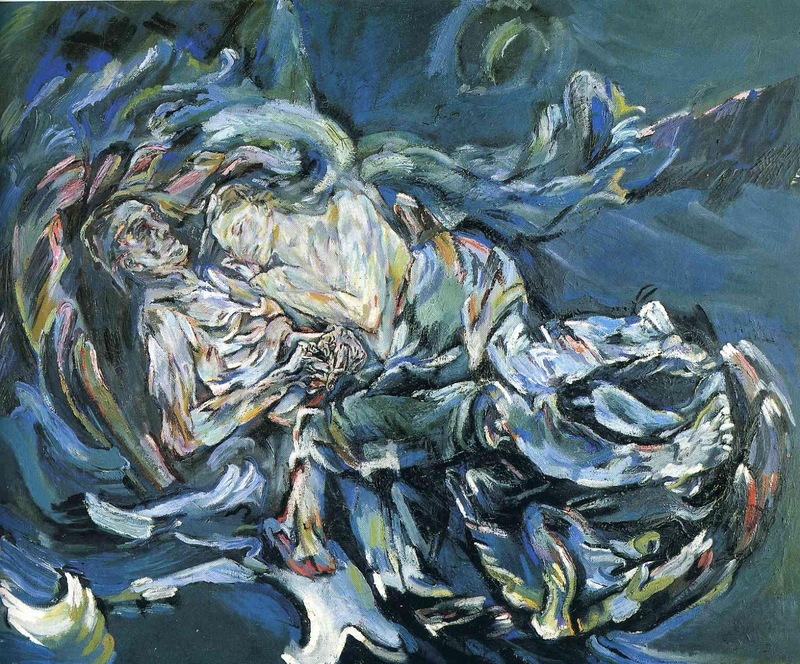 In this blue-and-gray composition, all the forms are described by large, loose strokes of colour, and the direction of the strokes seems to cause the entire composition to swirl and spin. 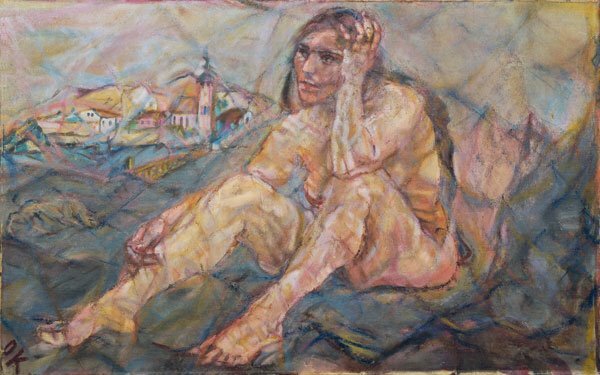 In all these paintings, as with the landscapes, the emotional involvement of the artist with the subject is essential, and it continued to be the basis of Kokoschka’s art throughout his life. 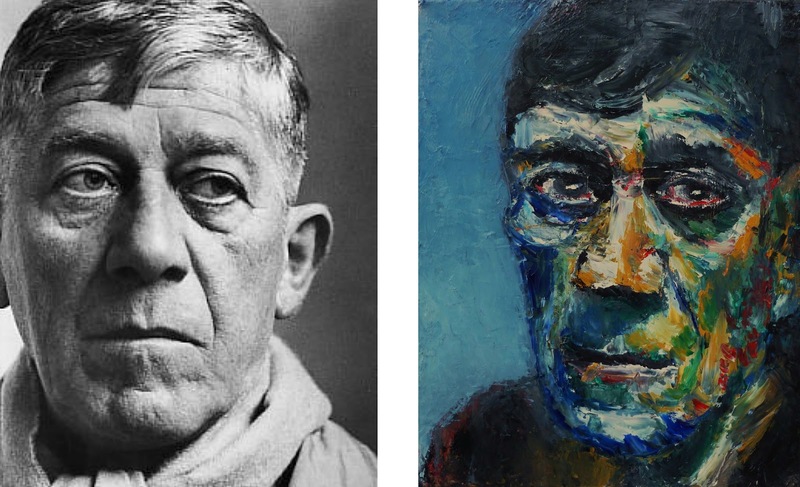 In 1962 he said, Painting…isn’t based on three dimensions, but on four. 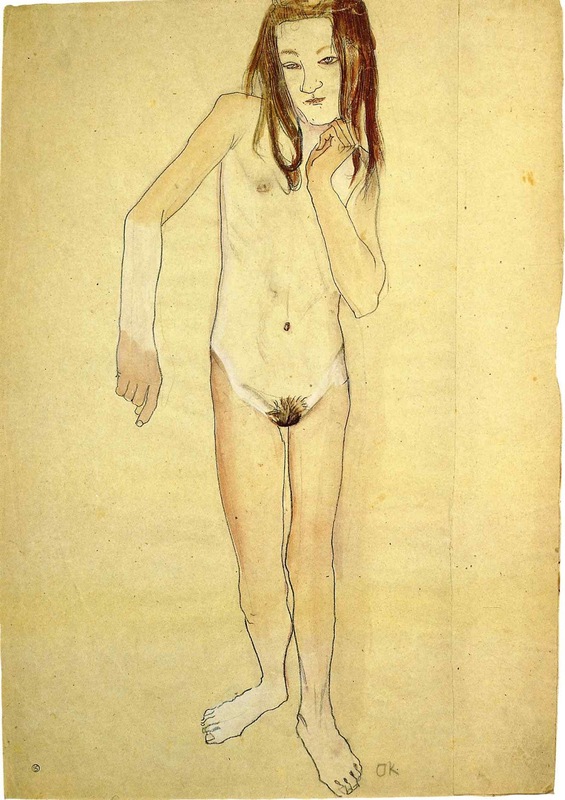 The fourth dimension is a projection of myself.…The other three dimensions are based on the vision of both eyes…the fourth dimension is based on the essential nature of vision, which is creative. 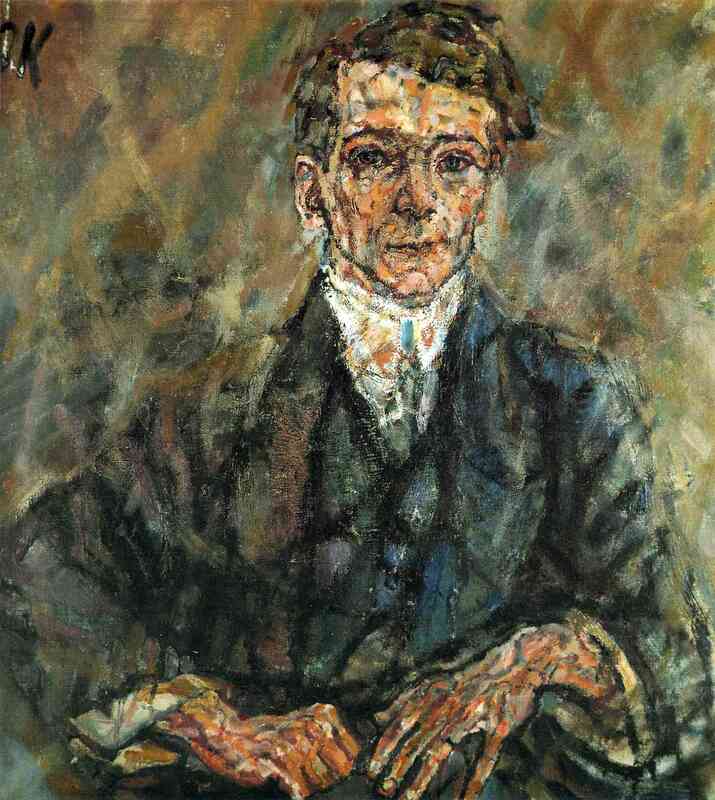 Kokoschka saw active duty in World War I for only a short time. 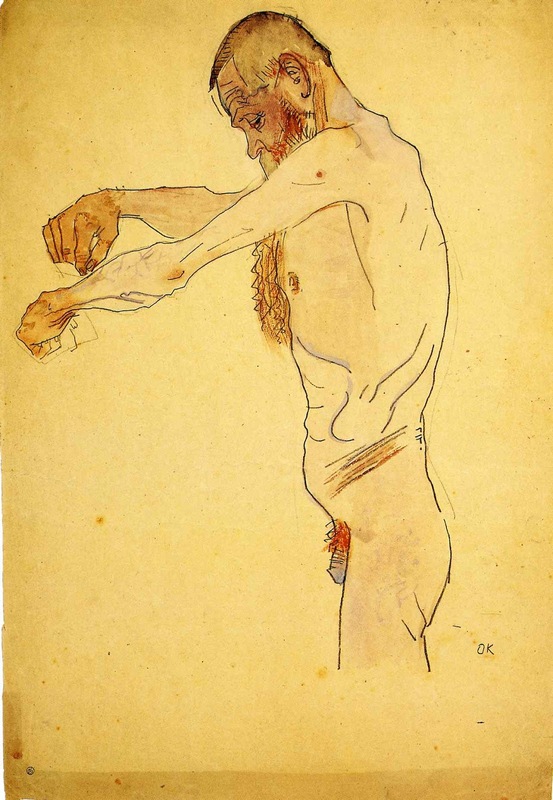 In 1915 he was severely wounded and was taken to a military hospital in Vienna, then to one in Dresden, Germany. 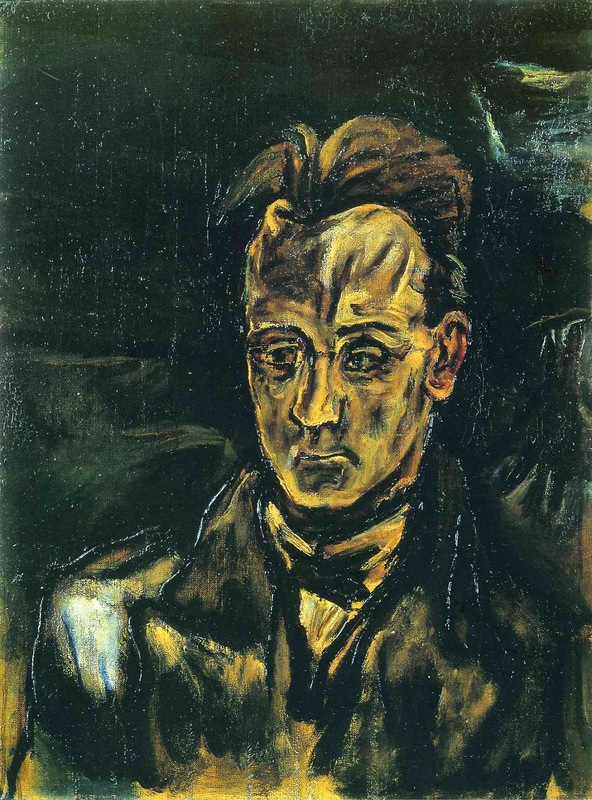 While recovering in Dresden he wrote, produced, designed, and staged three plays. 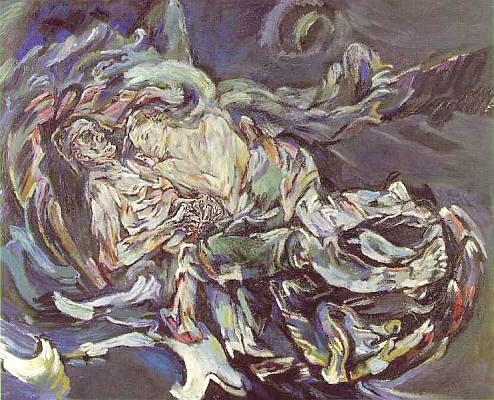 In Orpheus und Eurydike (1918) he expressed the terror he had experienced after being wounded. 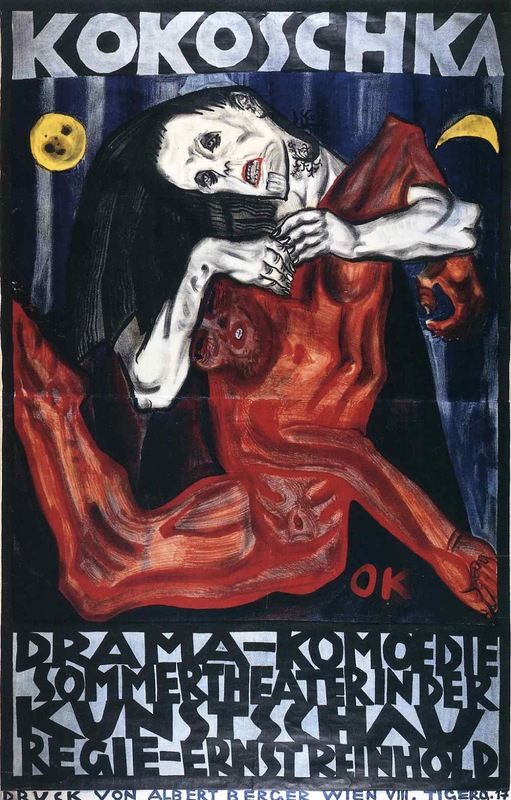 This play was adapted as an opera in 1926 by the German composer Ernst Krenek. 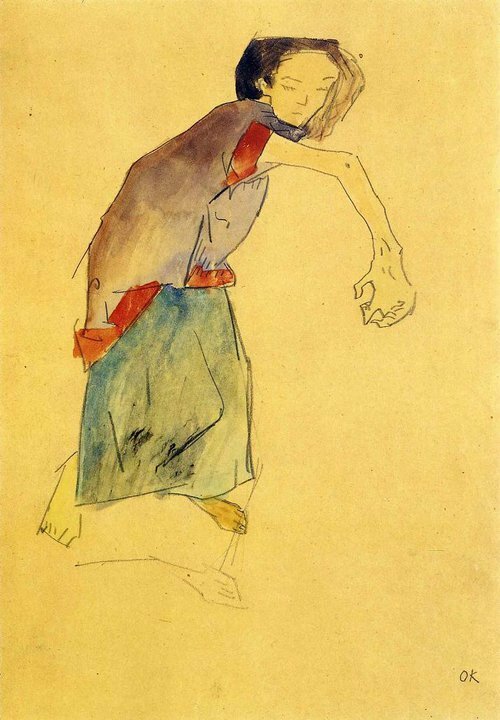 The war and the takeover of the Russian Revolution by the Bolshevik regime disillusioned Kokoschka, as it did many intellectuals who had identified revolution with humanitarianism. 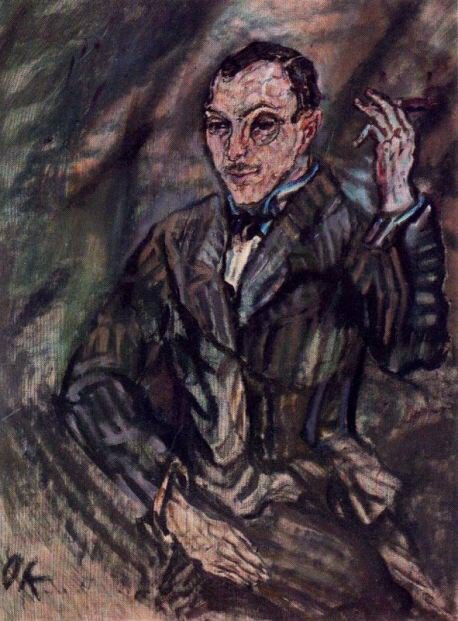 He began to see revolution as a purely destructive force, and in 1920 he wrote the “Dresden Manifesto”, which denounced all militancy in politics for its lack of human concern. 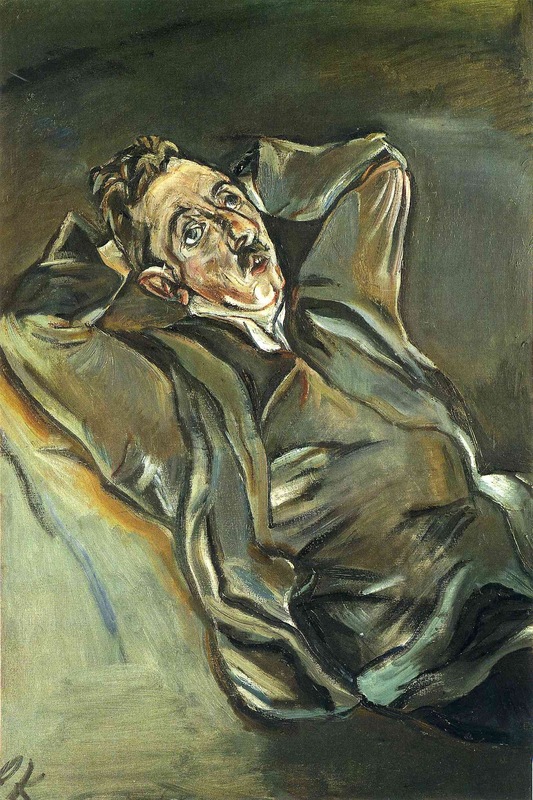 Political and humanitarian themes disappeared for several years from his writing and art. 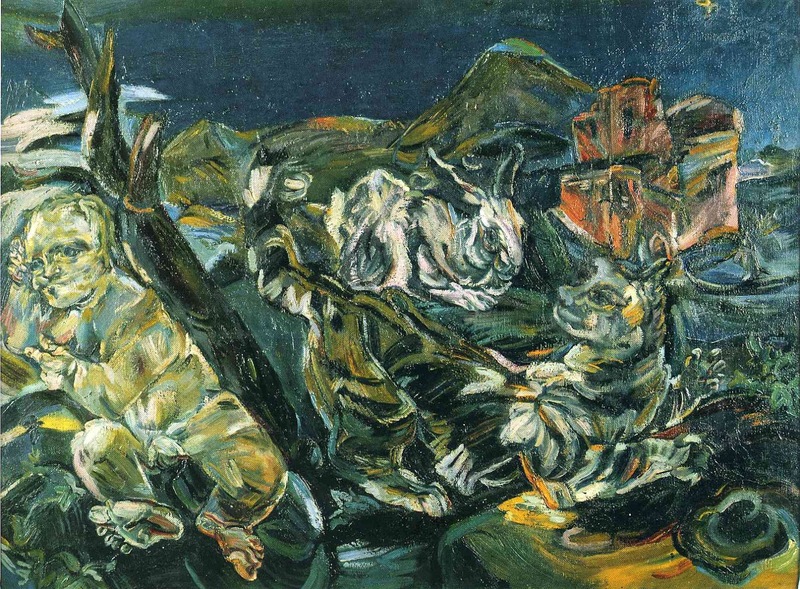 During the 1920s Kokoschka taught, primarily as a professor of fine arts at the Dresden Academy (1919–23), and he traveled in Europe, North Africa, and the Middle East, where he painted a series of landscapes that mark the second peak of his career. 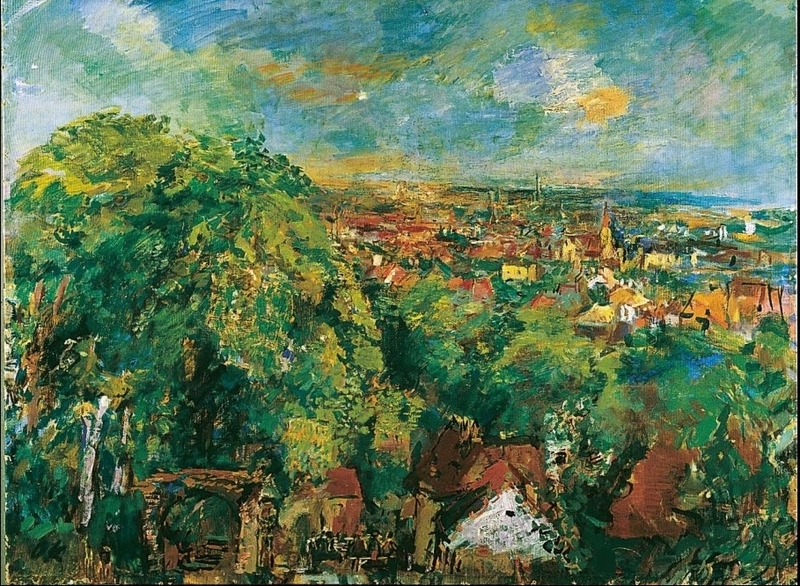 These panoramic views of cities or mountains, mostly seen from a high vantage point, are lyrical in mood and communicate effects of light and atmosphere through Kokoschka’s characteristically nervous brushstrokes and agitated compositions. 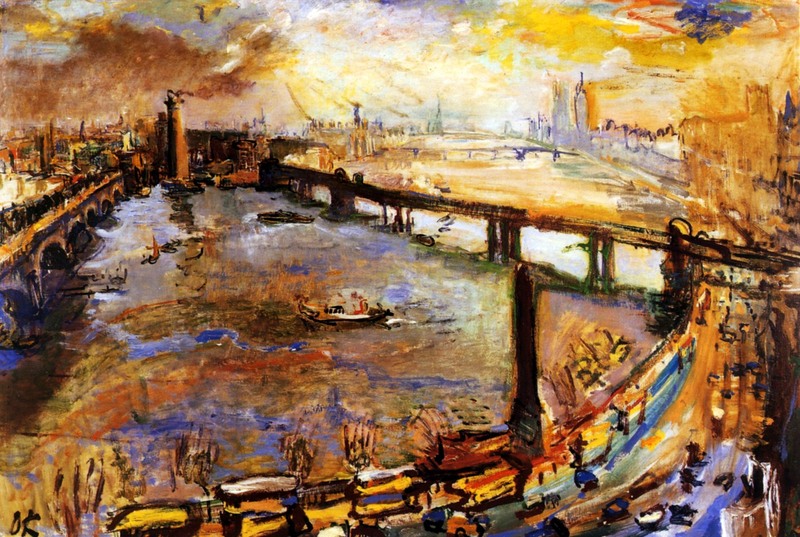 Among these works are London: Large Thames View (1926), Jerusalem (1929–30), and Prague: Charles Bridge (with Boat) (1934). 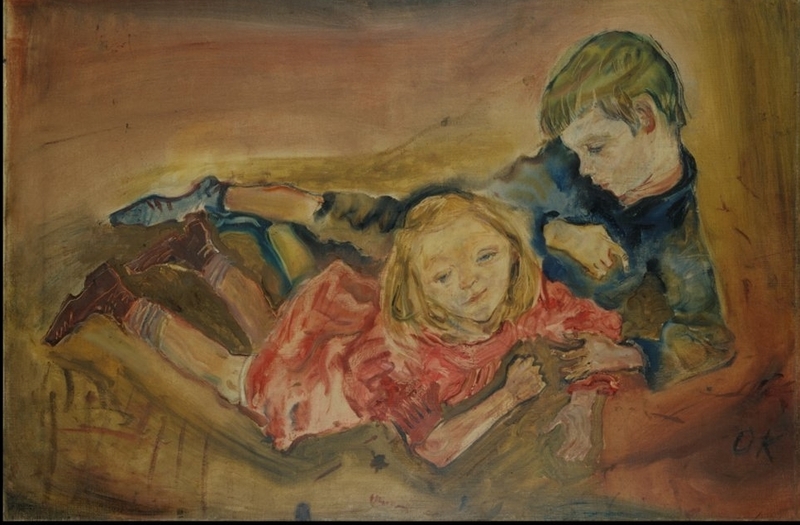 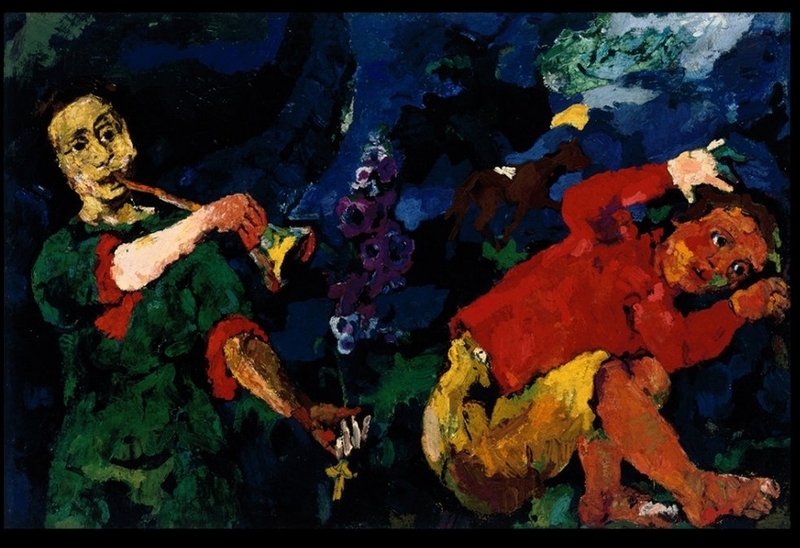 In 1931 Kokoschka returned again to Vienna, where he completed his first political commission since the war, a joyful painting of children playing at an orphanage established by the socialist city council. 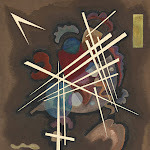 This painting was meant as a protest against the reactionary policies of the current Austrian chancellor. 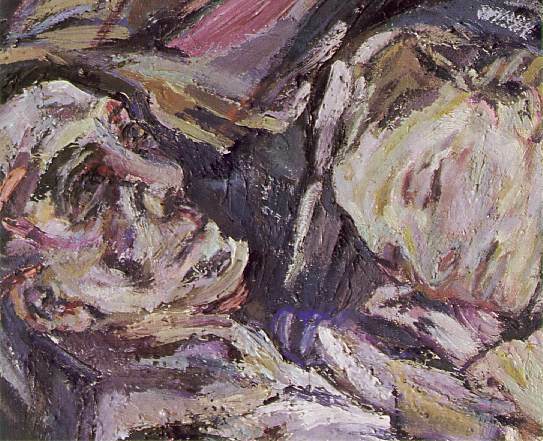 In 1934 Kokoschka moved to Prague, where he met Olda Palkovska, his future wife. 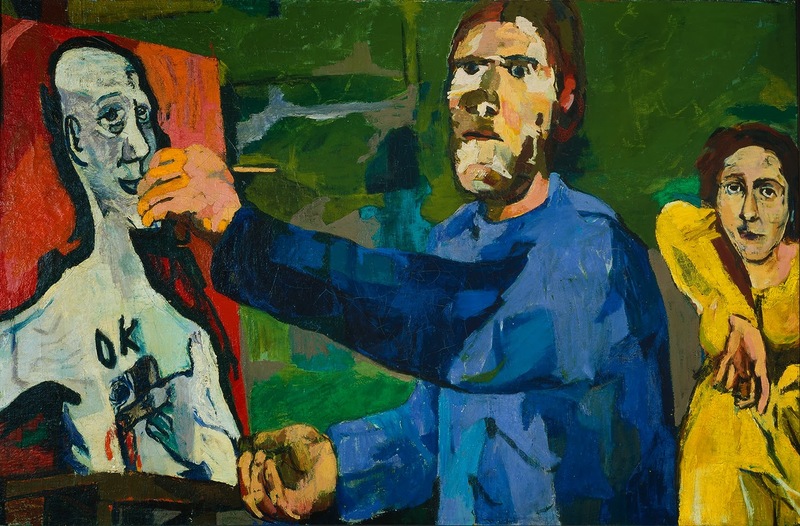 In Prague he was commissioned to do a portrait of the president of the Czech Republic, the philosopher Tomáš Masaryk. 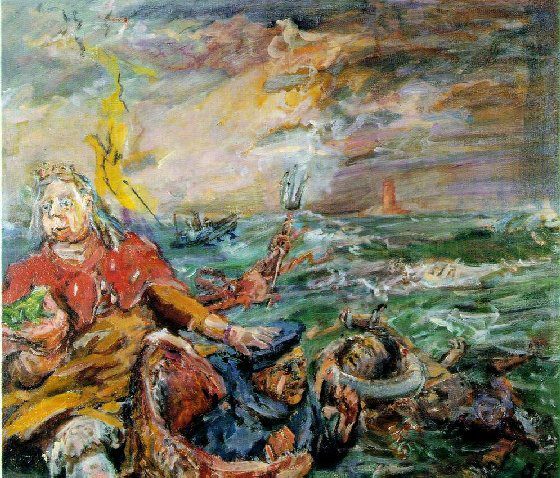 During the sittings he discussed with the aged statesman the philosophy of the 17th-century Moravian theologian John Amos Comenius, whose humanitarian views Kokoschka had admired from his youth. 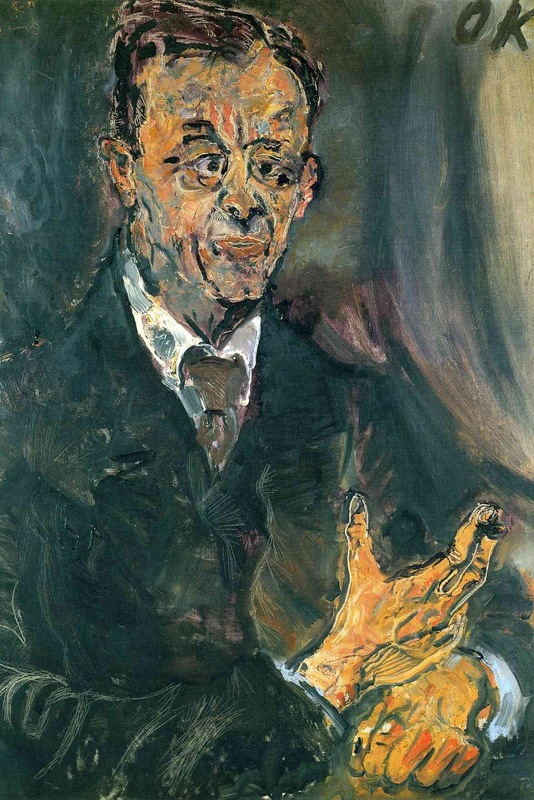 Kokoschka placed Comenius in the background of Masaryk’s portrait, creating an allegory of the humanistic spirit from past to present. 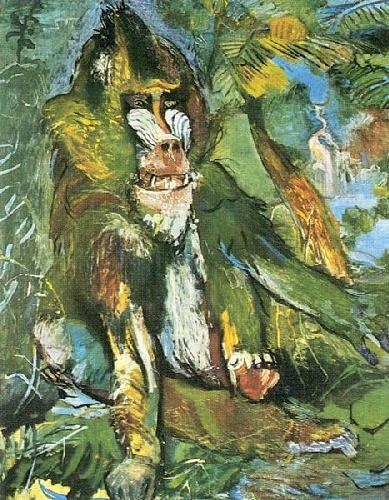 Comenius also became the subject of another play (Comenius, which Kokoschka began writing in 1935). 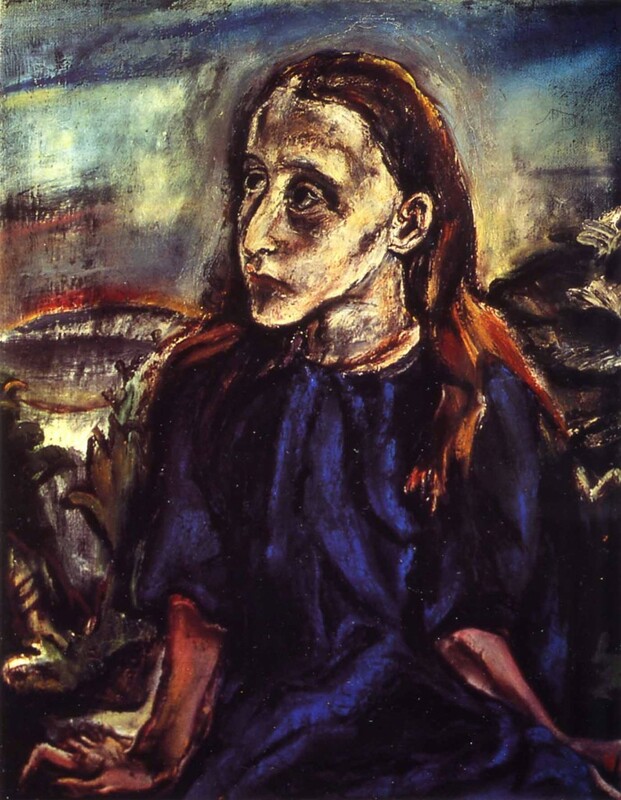 World War II and afterIn 1937 the Nazis removed all of Kokoschka’s works from German museums and collections, denouncing them as “degenerate art”. 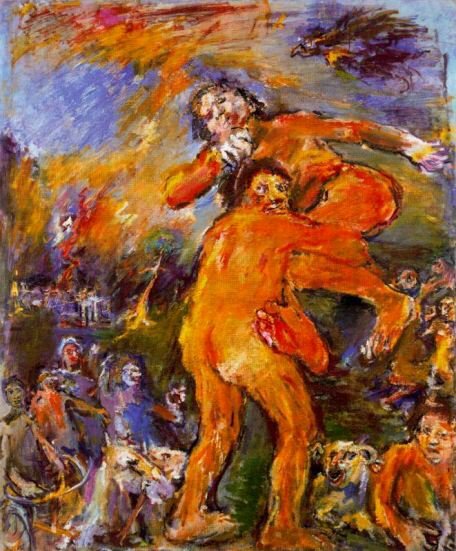 This act outraged Kokoschka less for his own sake than because it boded ill for the future of culture and humanity. 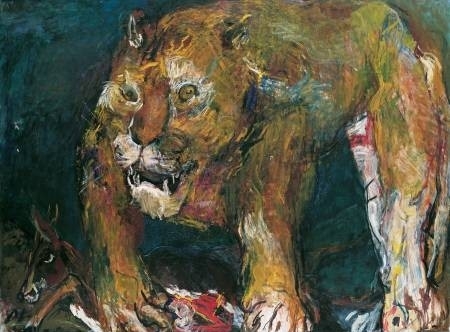 The fact that a great Kokoschka exhibition was held in Vienna that year did not allay his fears. 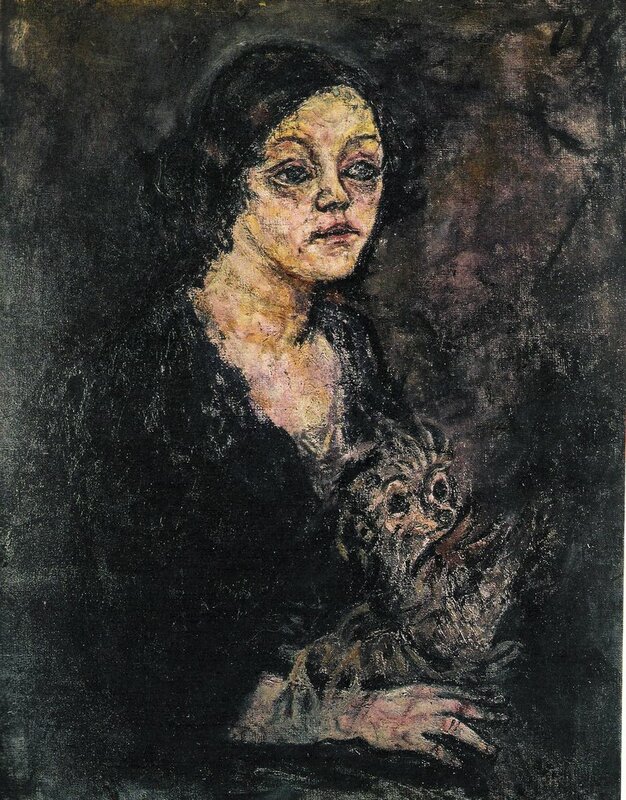 After the Munich agreement between the English prime minister Neville Chamberlain and Hitler in 1938, Kokoschka fled to London with Olda Palkovska. 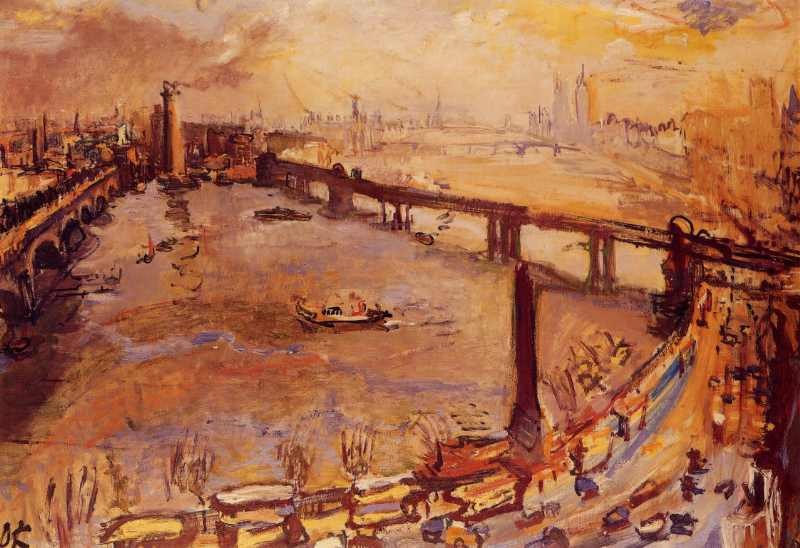 Kokoschka’s financial situation in London was so desperate that he was forced to paint mainly in watercolour, a less-expensive medium than oil. 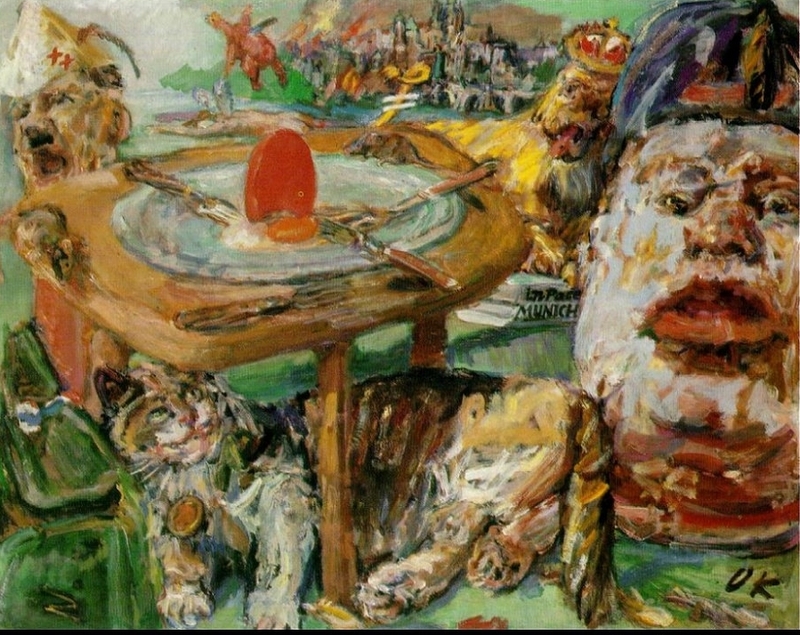 He completed a number of large canvases on antiwar themes, however—including The Red Egg (1940–41), Anschluss—Alice in Wonderland (1942), Loreley (1942), Marianne-Maquis (1943), and What We Are Fighting For (1943). 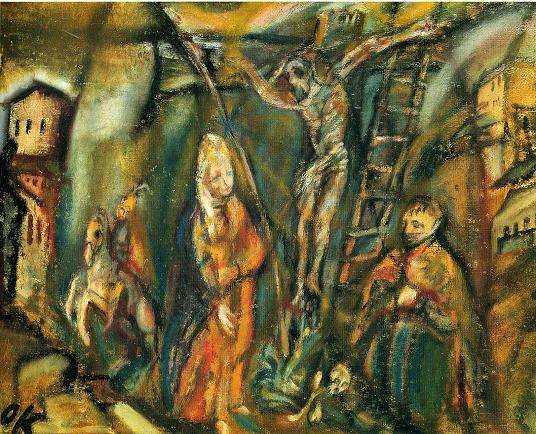 These works express his distress at the sufferings of humanity, yet are free from narrow ideological considerations; the series is an indictment of all the powers, not just the fascist ones, that had caused suffering in World War II. 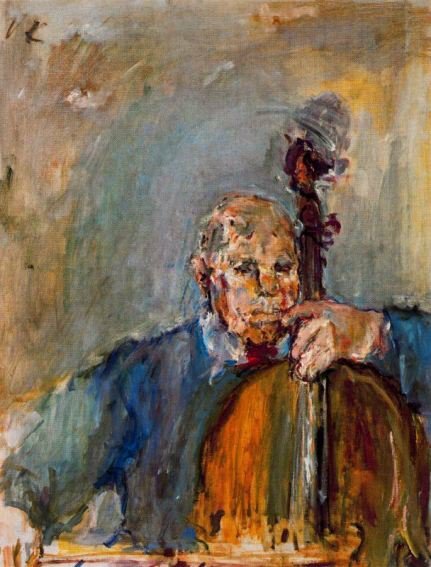 In 1942 Kokoschka also painted a portrait of the Russian ambassador to London, Ivan Maysky, and donated the fee for the painting to the Red Cross for the care of German and Russian soldiers wounded in the Battle of Stalingrad. 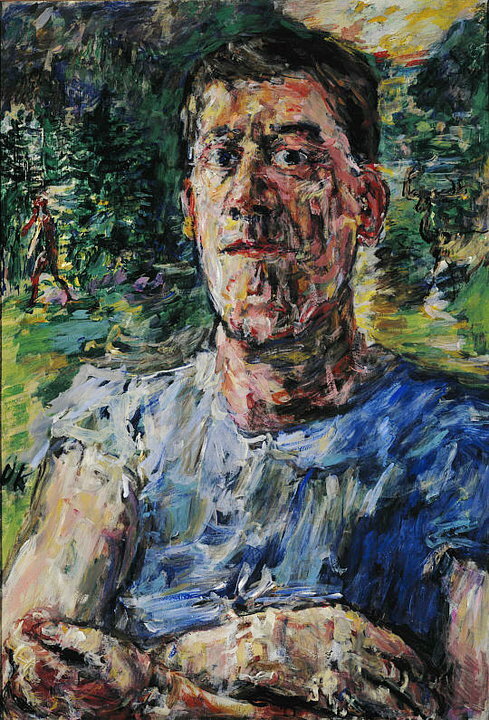 He became a British subject in 1947. After the war, beginning with a large exhibition in Vienna in 1947, Kokoschka was honoured with a series of exhibitions of his work in Zürich, London, Venice, and elsewhere throughout Europe and in the United States, and he became financially secure for the first time. 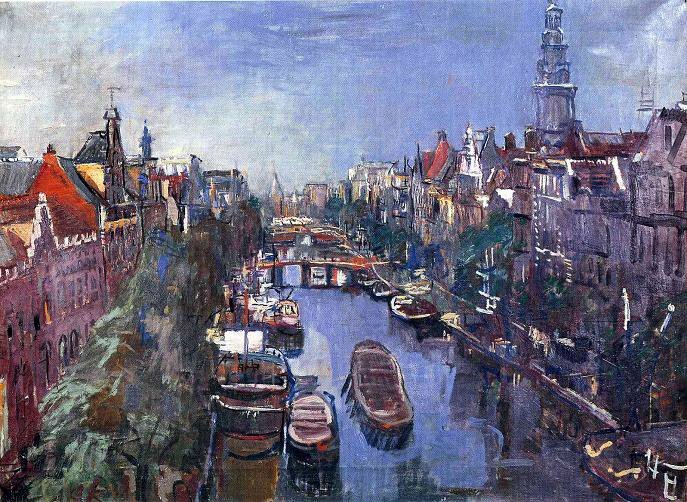 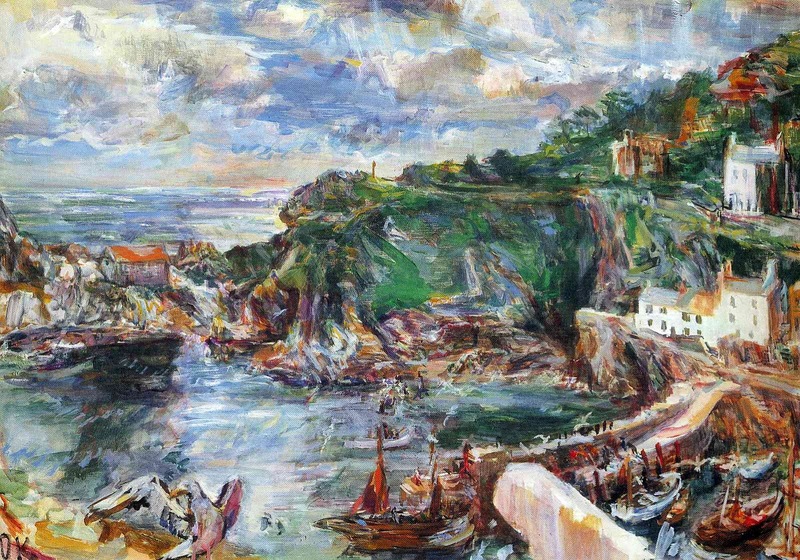 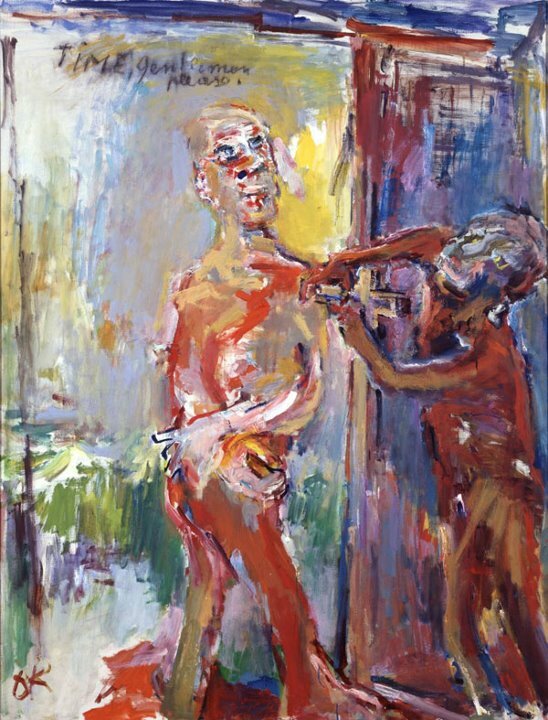 He continued to paint portraits and landscapes; among Kokoschka’s late landscapes that retain the energy of his earlier works are View of Hamburg Harbour (1951), Delphi (1956), Vienna: State Opera (1956), and Lübeck: Jakobikirche (1958). 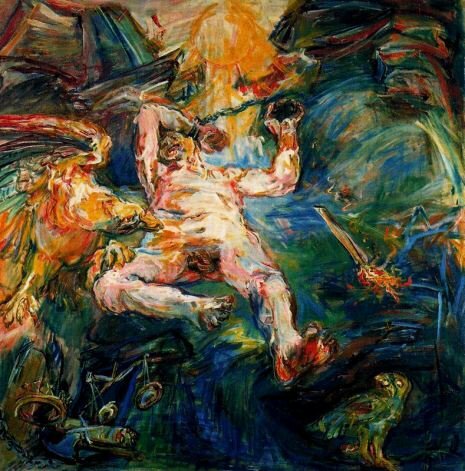 In 1950 he created his first major mythological compositions, the three paintings of the Prometheus Saga. 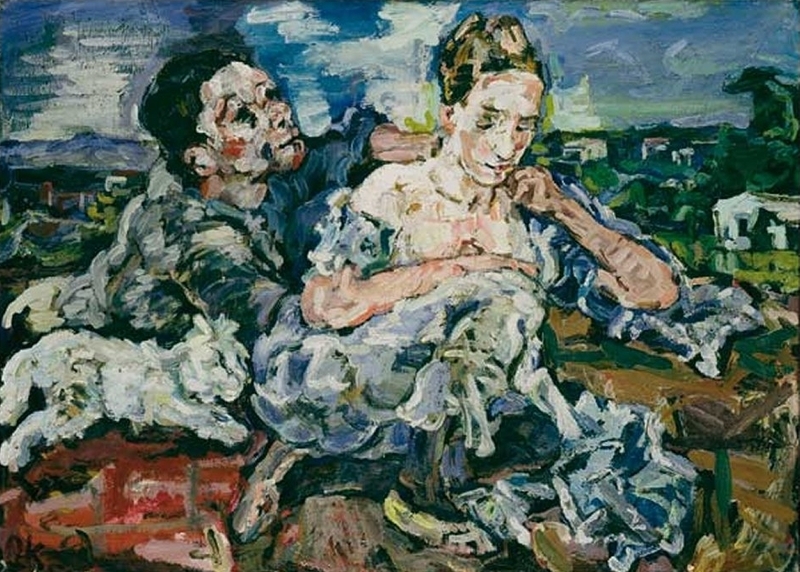 In 1953 Kokoschka moved to Switzerland and established an annual seminar called Schule des Sehens (“School of Seeing”) at the International Summer Academy for Visual Arts in Salzburg, Austria. 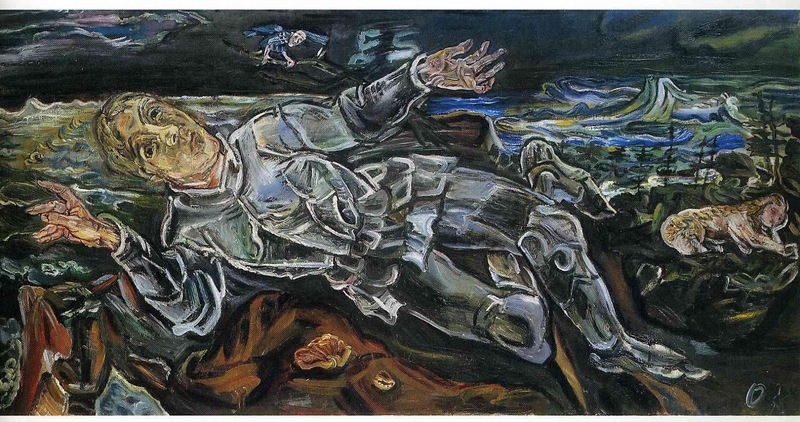 He also completed a second mythological trilogy, Thermopylae (1954). 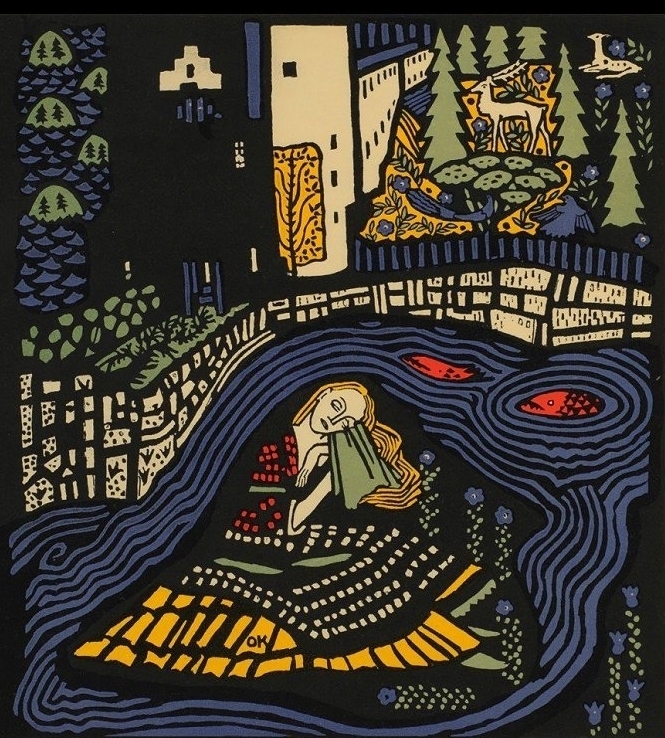 In the 1950s Kokoschka designed tapestries and theatrical scenery and worked increasingly in lithography. 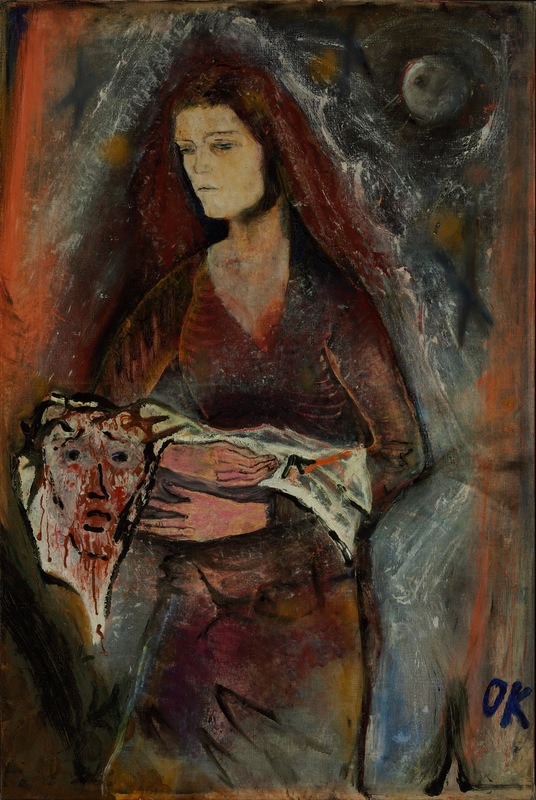 He also continued his political art; he designed two poignant posters protesting the effects of the Spanish Civil War and World War II on the children of Europe (1937, 1945), and a poster for Hungarian relief showing a stricken mother and a dead child (1956). 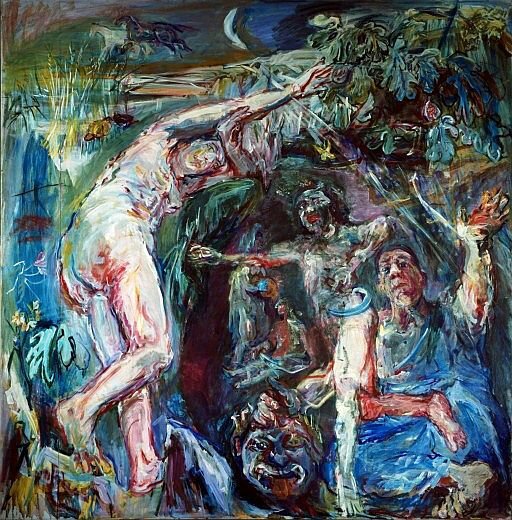 Kokoschka’s last paintings are perhaps best characterized by Herodotus (1960–63), a luminously painted picture of the Greek historian as he is inspired by visions of historical figures that appear above his head; it is Kokoschka’s tribute to the importance of memory. 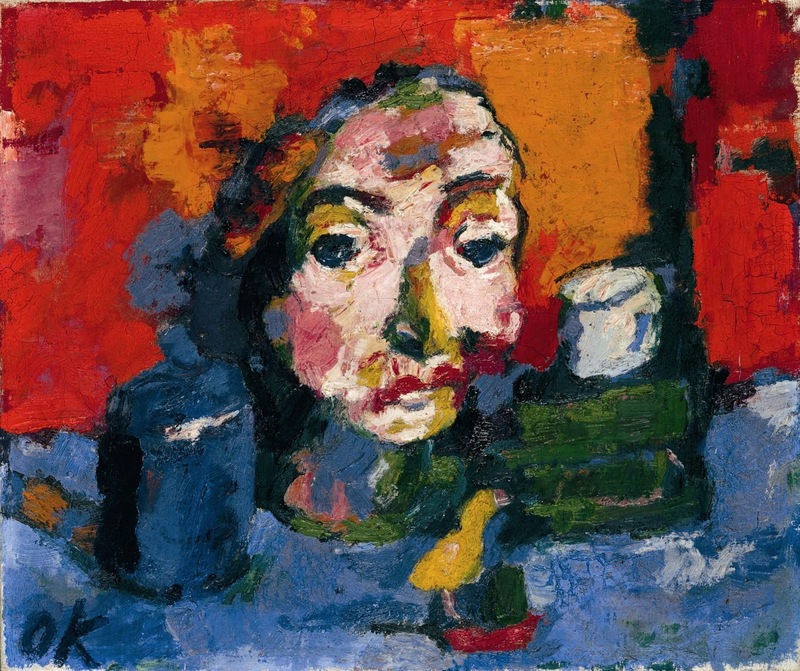 His late style is calmer and brighter than that of his early works, but some critics claim that the late paintings lack the agitation and surface intensity of his early masterpieces. 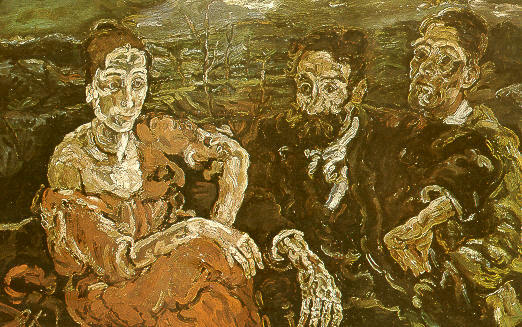 Kokoschka’s My Life (1964) is an excellent autobiography. 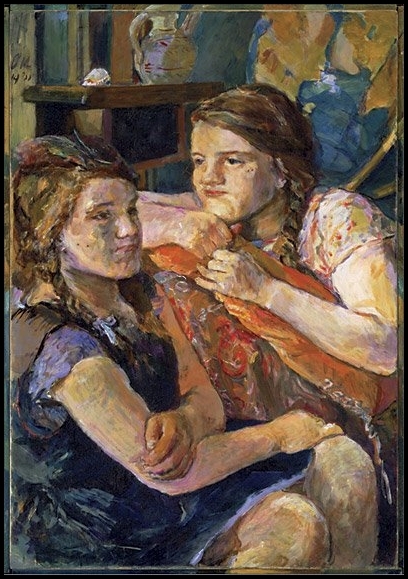 | by Ludwig Goldscheider © Encyclopædia Britannica, Inc.
Oskar Kokoschka (1886-1980), pittore Austriaco, iniziò la sua attività pittorica nel clima della secessione viennese che in quegli anni aveva come suo maggior protagonista Gustav Klimt. 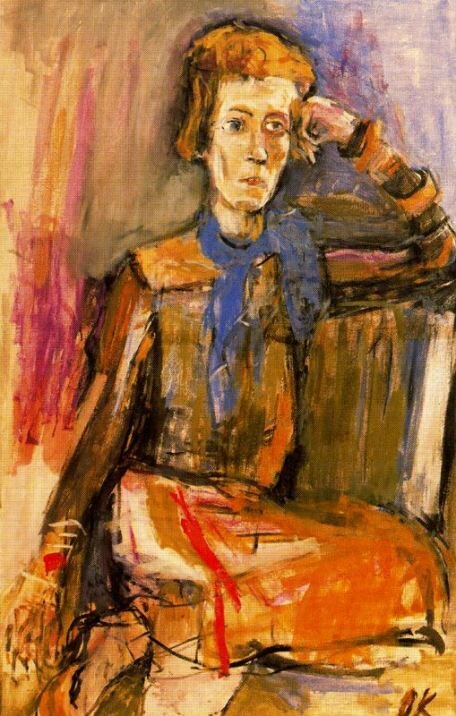 E l’attività giovanile di Kokoschka è influenzata soprattutto dal diretto contatto che egli aveva con il maestro della secessione. 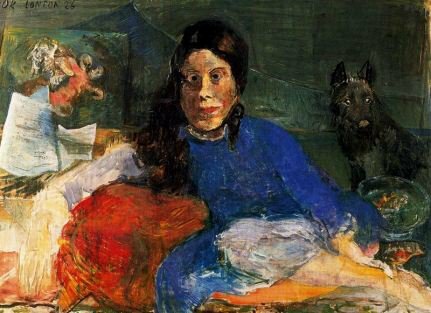 In seguito venne a contatto con il gruppo espressionista tedesco «Die Brücke» ed espose alcune sue opere nelle mostre organizzate dal gruppo «Der Blaue Reiter» Egli non aderì mai ufficialmente all’espressionismo, tuttavia le sue opere di quegli anni rappresentano alcuni dei massimi vertici dell’espressionismo storico. 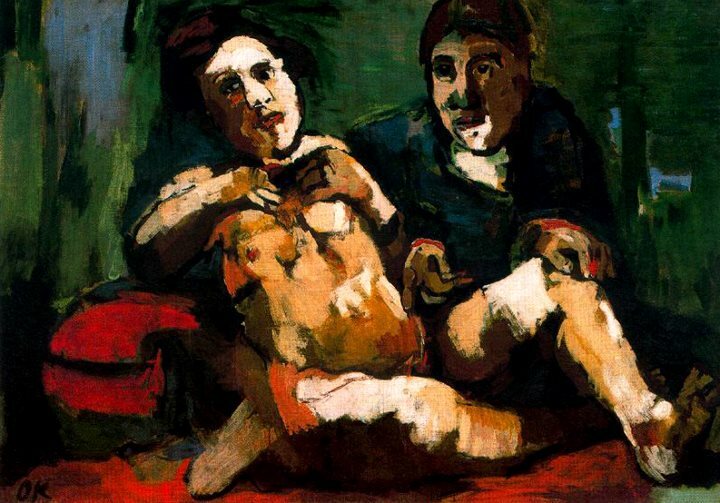 Nel 1917 venne a contatto con il gruppo Dada, ed a partire dal 1920 la sua pittura cominciò a distaccarsi dall’Espressionismo, per dedicarsi ad una autonoma ricerca che lo portò a reinterpretare l’impressionismo in una nuova chiave moderna. 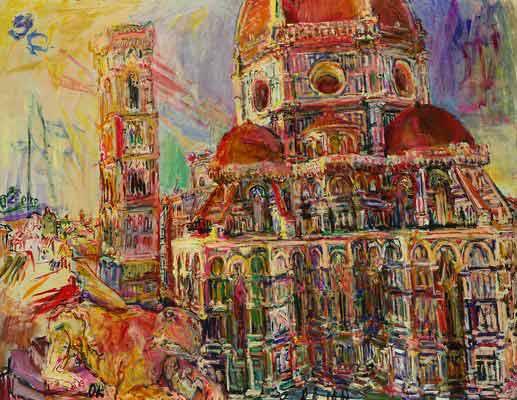 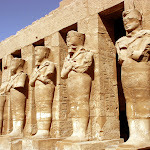 Dopo la guerra insegnò presso l’Accademia di Dresda e cominciò una serie di viaggi che lo portarono in varie parti del mondo, tra cui l’Italia, alla quale fu legato da intenso rapporto affettivo. 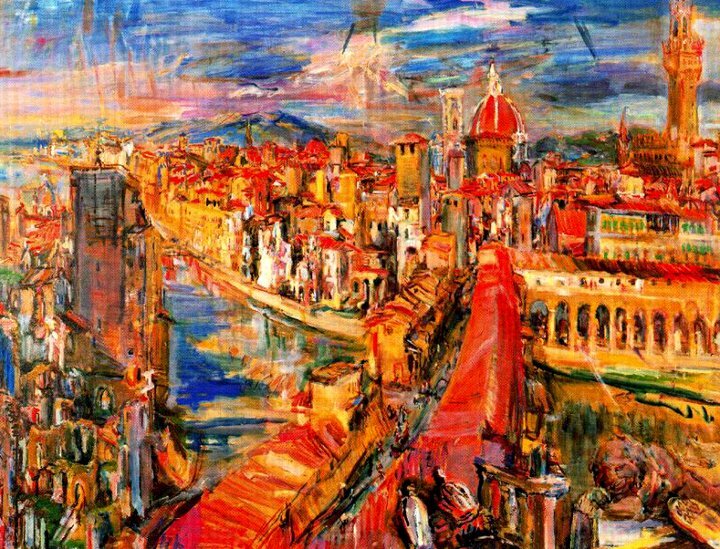 Nel 1934, dopo che i nazisti avevano giudicato anche la sua pittura «arte degenerata», si trasferì a Praga per poi portarsi a Londra. 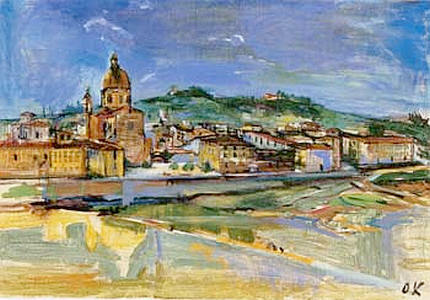 Ottenuta la cittadinanza britannica, nel 1953 si stabilì definitivamente a Villeneuve, sul lago di Ginevra. 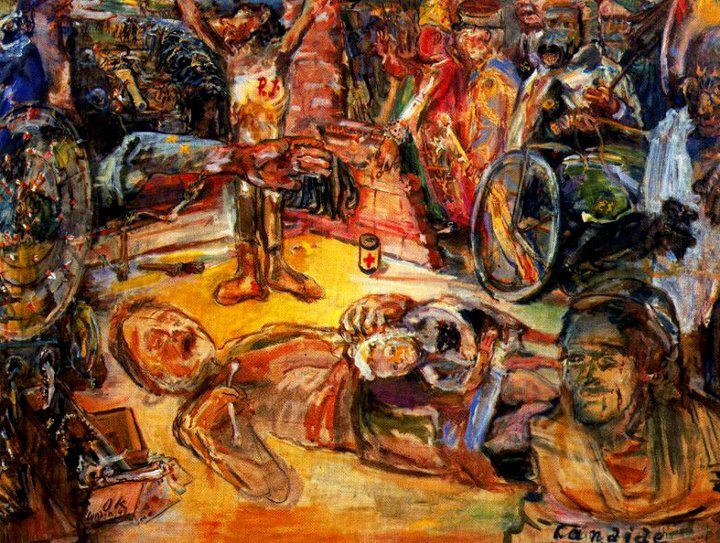 È morto nel 1980 all’età di 94 anni.